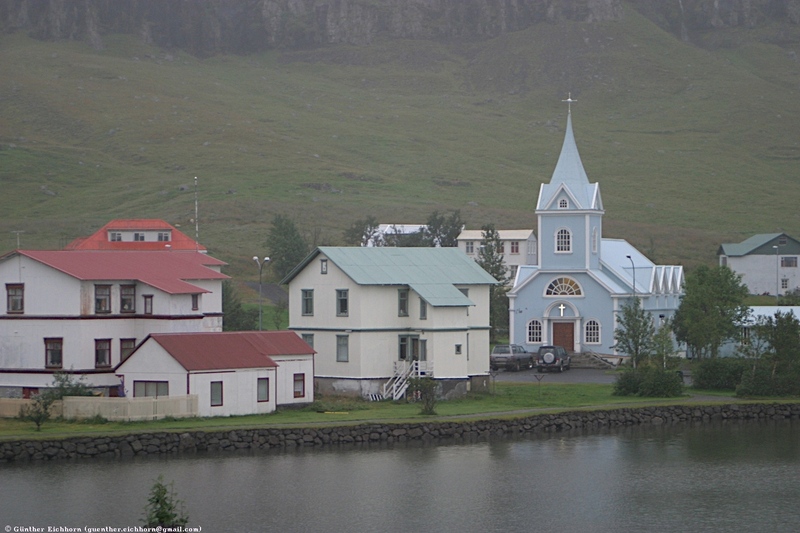 In September 2006 I visited the westernmost country in Western Europe, Iceland, for 11 days. It was the end of the summer season, so I didn't make any reservations, I just drove around and looked for a hotel in late afternoon. There was never a problem finding a hotel. I assume it is different during the tourist season in July and August. In fact, several tourist attractions were already closed for the season, they close at the end of August. What I missed most were the birds. Nesting season was over, and most of the birds had already left. I was hoping to still see some of the puffins, but no such luck. 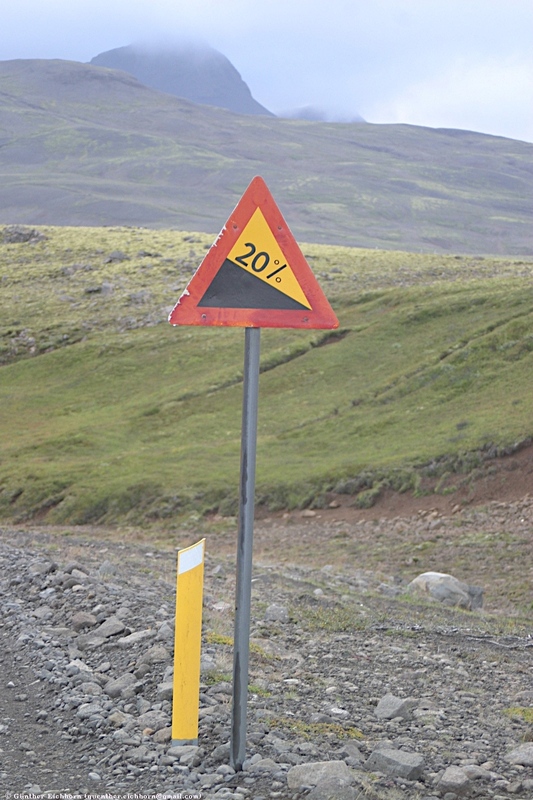 The one thing about Iceland that is remarkable in a negative way is the cost. Iceland is hideously expensive. A beer costs $10, fuel costs $1.90 per liter ($7.50 per gallon). An inexpensive meal in a restaurant costs $30, most of the time it is more like $40 - $60. Hotels are expensive as well ($150 and up). I stayed in Hostels a couple of time ($40 - $50), but I just don't like having the bathroom across the hall. One good part here is that all the natural attractions are free to visit. There are no entry fees to any of the parks, water falls, geysers, or other interesting points. Activities like snowmobiles or kayaks on the other hand are again quite expensive. The snowmobile trip was about $110 and the kayak trip was $90. 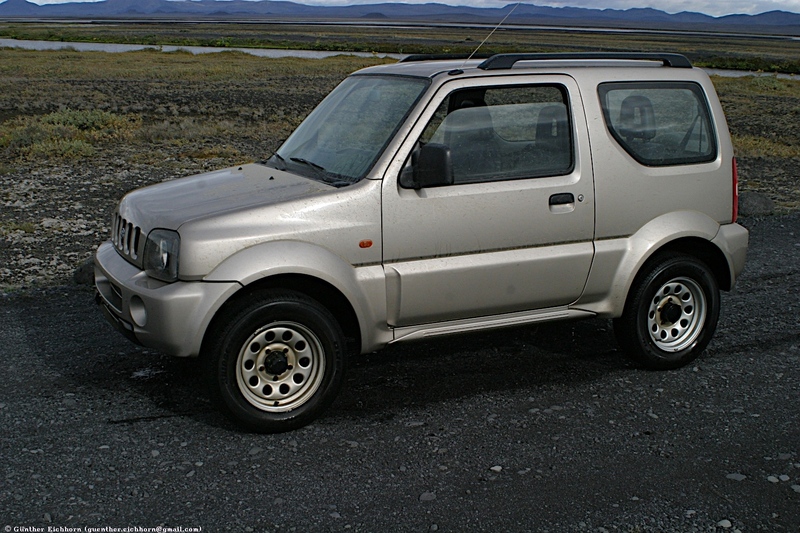 To get around I rented a 4 wheel drive Suzuki Jimmy. It was a good choice, I got through everything. 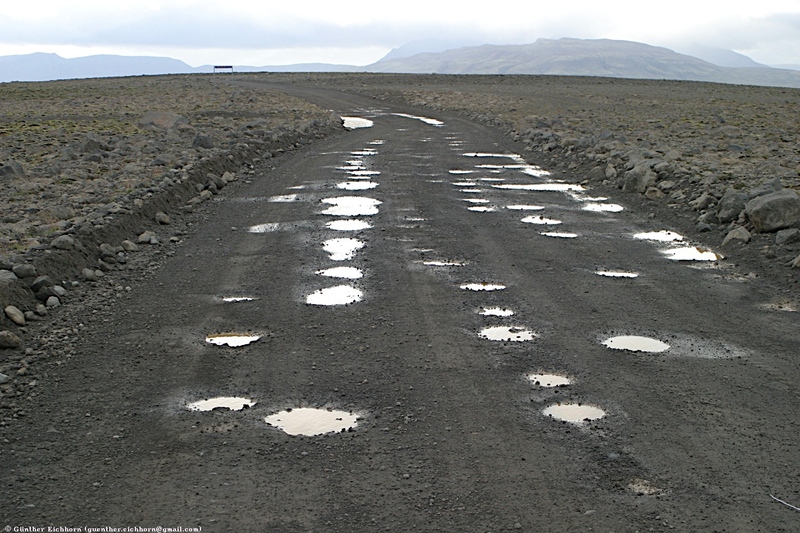 Iceland has a lot of unimproved roads. In the interior there are a lot of routes that can only be negotiated with such 4-wheel drive vehicles. And don't think you can handle them in a Subaru passenger car. There are no bridges over the smaller rivers. Some of these rivers that have to be crossed are deep. A passenger car would float away. The deepest ford that I crossed was over 1 m (3 ft) deep. Even the Jimmy got a little light on its wheels, but got through. I criss-crossed all over Iceland, driving over 5,000 km (3,100 miles) total. It was a lot of fun, I like that kind of driving. 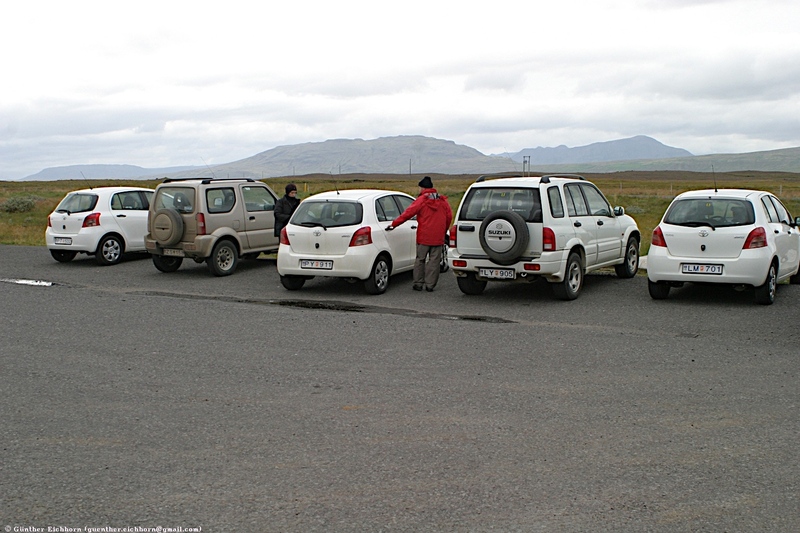 In the interior there is not much traffic, you may see three or four cars along the whole Sprengisandur, the main road through the center of Iceland. 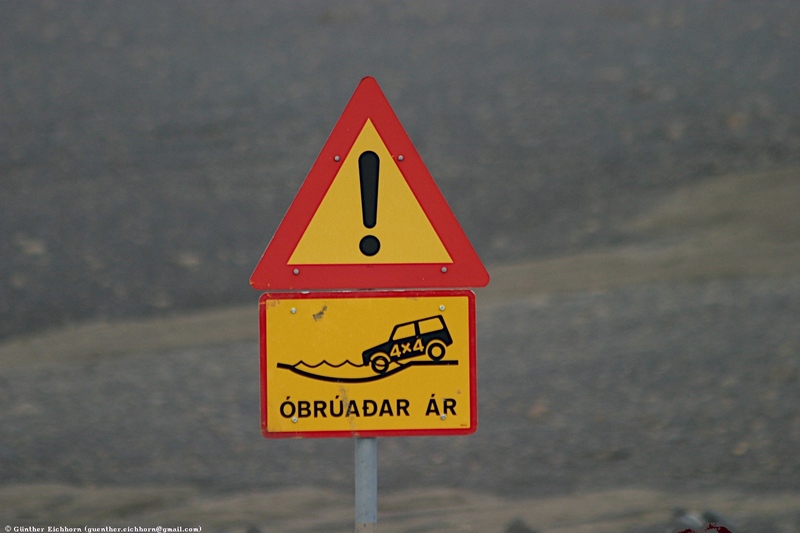 4WD roads are marked specially on maps (see Map of Iceland). But other roads can be unpaved as well. Even the main ring road, Route 1, has some unpaved sections. 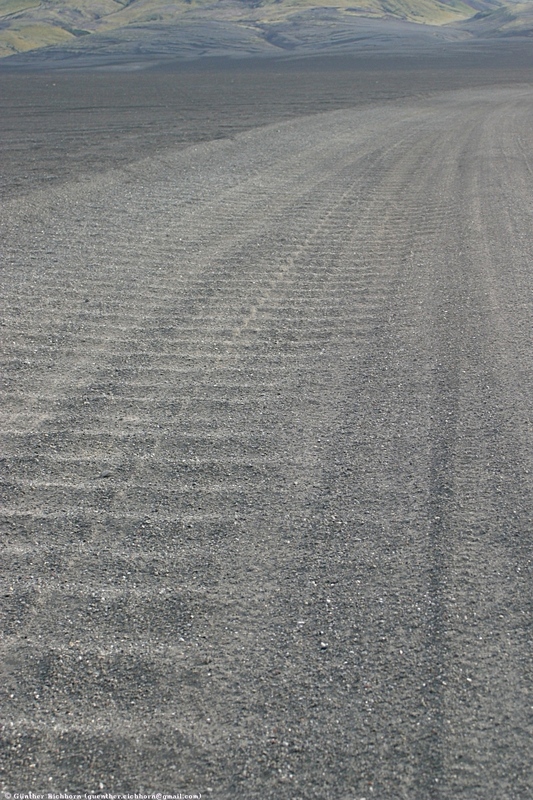 These unpaved roads are not marked separately on maps. They are mostly in decent shape, but can get pretty bumpy in places. The speed limit is 90 km/h (56 mph) on paved roads, and 80 km/h (50 mph) on unpaved roads. There are not all that many unpaved roads where you can drive faster than that. The speed limit on paved roads is a bit low, especially considering that there is not much traffic in general. I didn't take that limit too literal while I was there. My itinerary is shown in red on the map of Iceland above. Some of the roads are quite challenging. 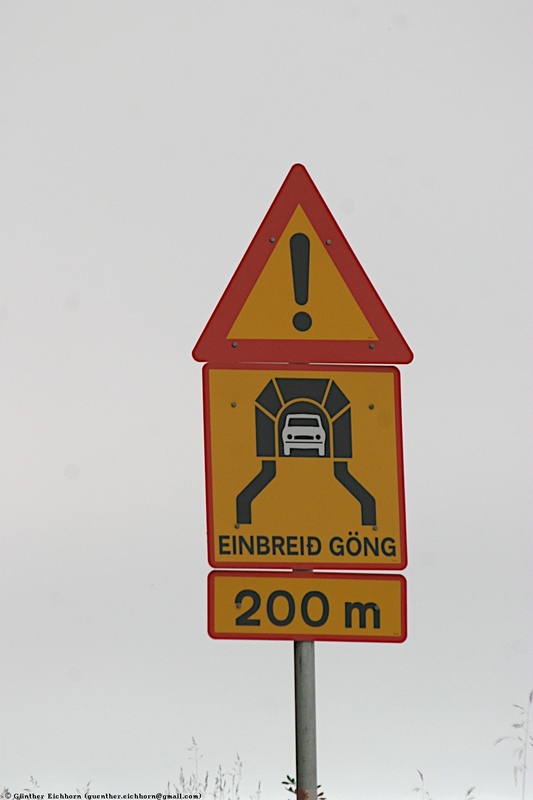 On one occasion I drove through three fjords, ending up in a dead-end fjord and having to turn back. 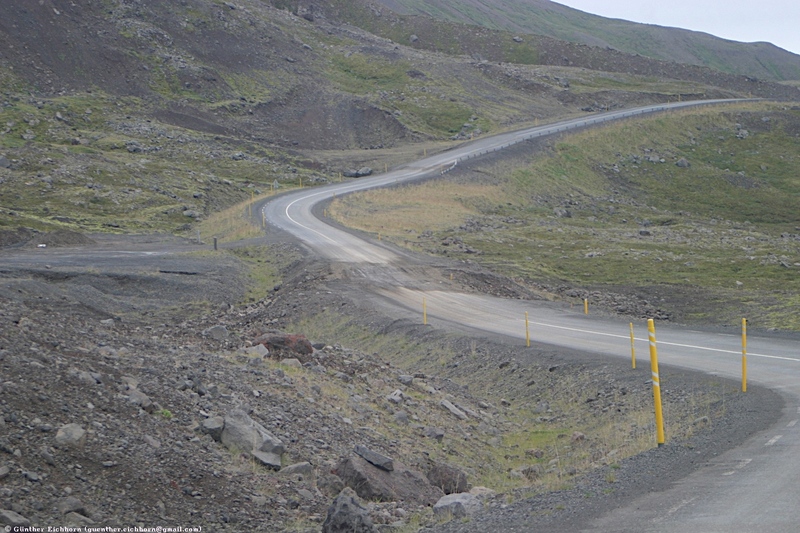 The track over the mountains between the fjords was the steepest that I drove on. The road was just a track and the slope was in excess of 30% in some places. 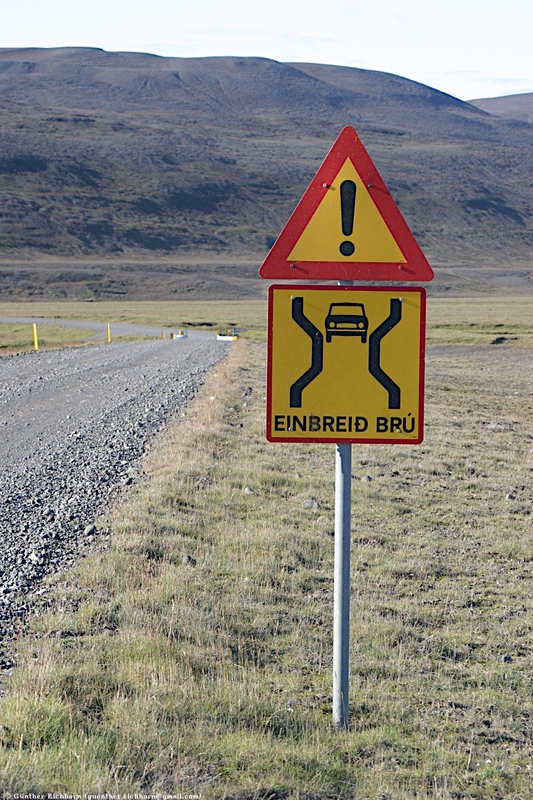 There are some road signs that are not common in other countries (see pictures). Especially the signs about 4WD roads and river crossings are noteworthy. 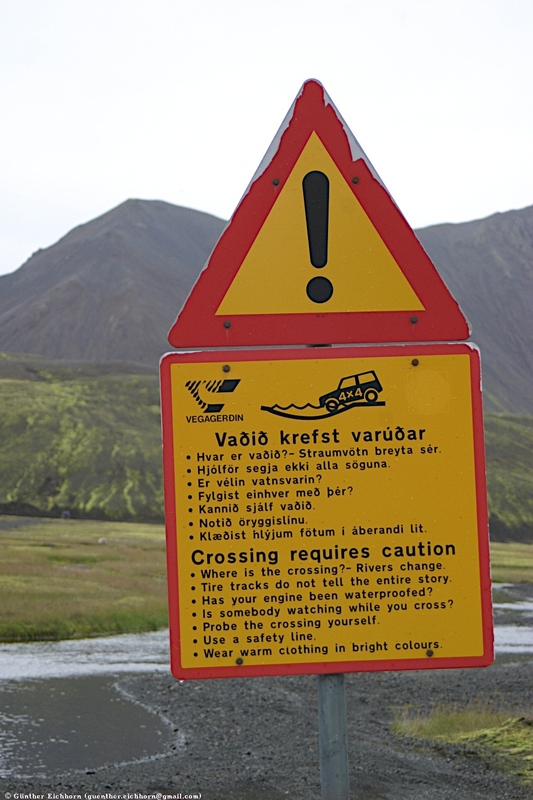 On my first day in Iceland I got to one of the big warning signs before a river crossing. 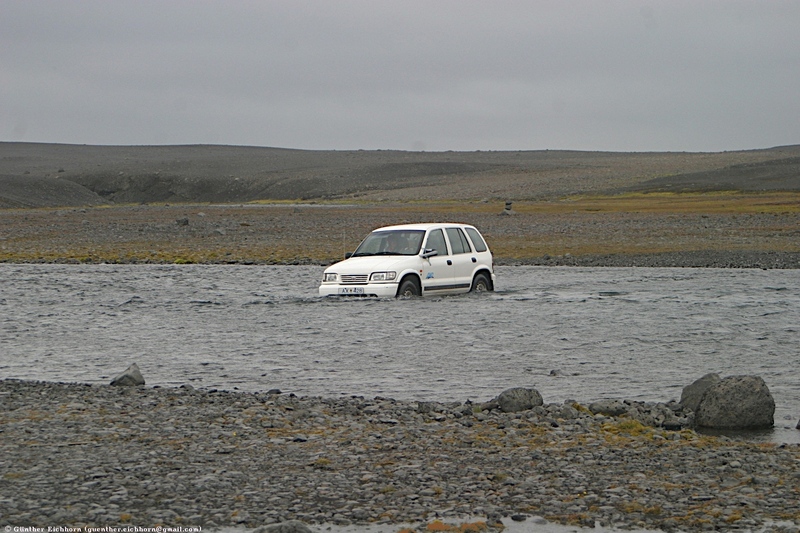 At that time I didn't have enough experience with the car and how it handles water, so I was cautious and turned back. Once I had more experience how the car handled rivers I had no problem crossing such river fords. One sign that you see very frequently is for one-lane bridges. 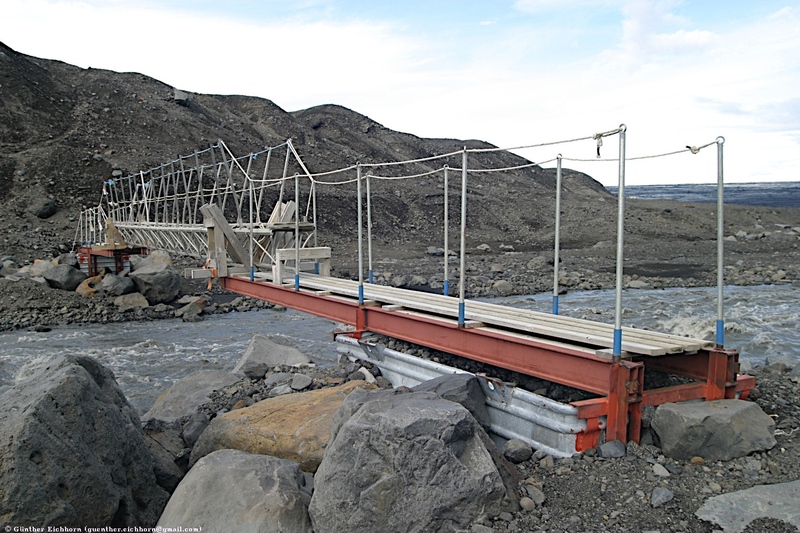 Many, if not most bridges, certainly all of them on unpaved roads are one lane only. Whoever gets there first has the right of way. This is really not a problem, since the traffic density is so low, you rarely meet another car. I also drove through a couple of tunnels, the longer one was about 3.5 km (2.2 miles) long. They also were one lane only. To handle that, there are passing bays in regular intervals on one side of the road. The traffic that has the bays on their side is the one that has to give way to oncoming traffic. It works very well, especially since the traffic density is so low on these roads. 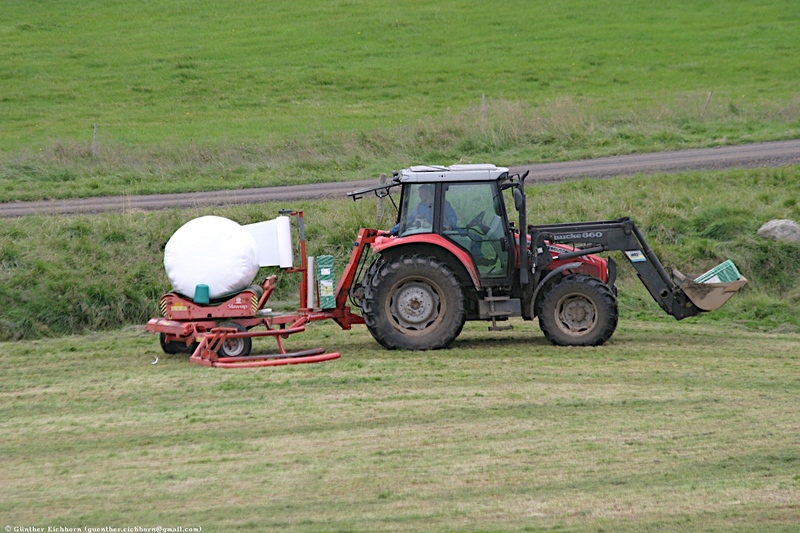 One thing that you need to watch out for is your fuel situation. There are often long stretches of road without fuel stations. 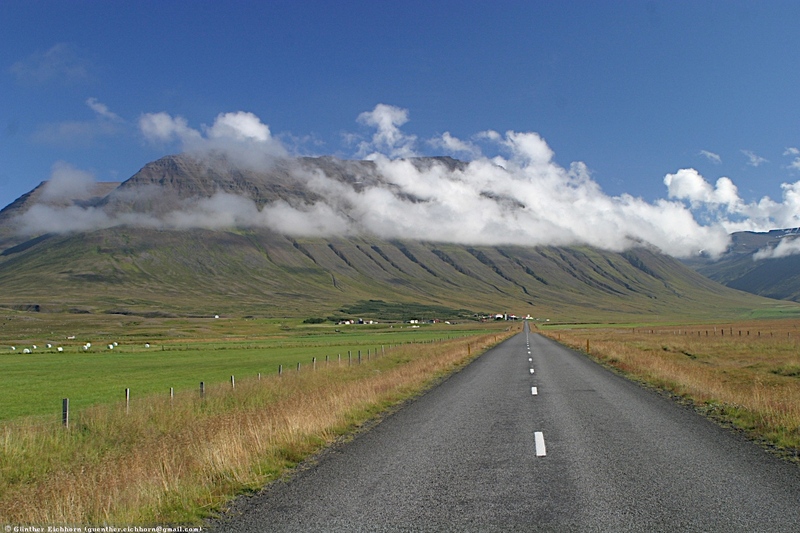 The longest that I drove is the Sprengisandur, 240 km (149 miles) through the center of Iceland without a fuel station. I had a map that showed Esso fuel stations. There are of course others, but I based my calculations on the known stations. I always made sure I had enough fuel to get to where I wanted to go, or turn around and get back to the last station, in case I hit an impassable river. 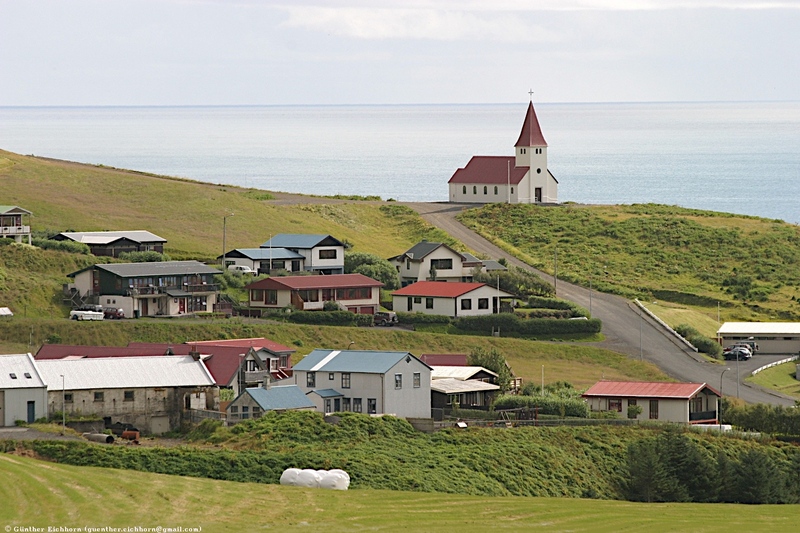 Iceland is a small country as far as population goes. 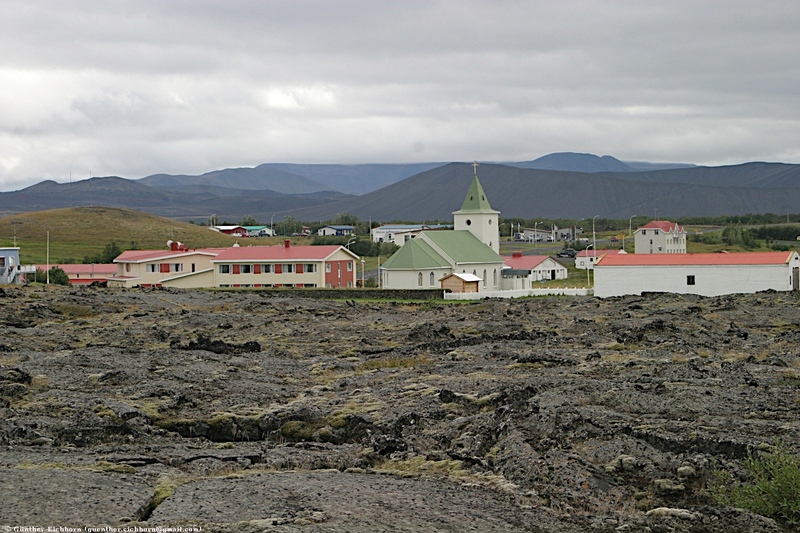 There are less than 300,000 Icelanders on that island, 180,000 of those live in greater Reykjavik. 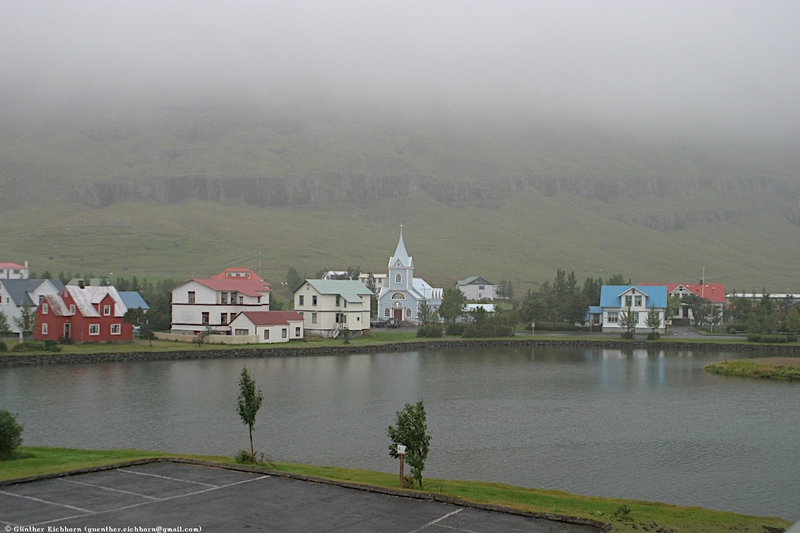 Akureyri, the second largest town has a population of some 16,000. That means that the population density in Iceland s very low. In most areas you see farmstead every few miles, sometimes nothing for 15 km (9 miles) and more. Essentially nobody lives in the central part of the island. 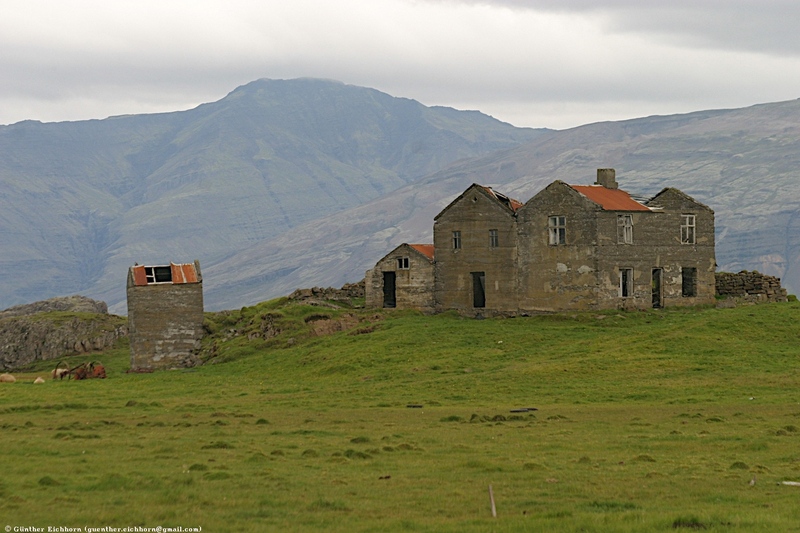 You can see many abandoned farms, where people have left the farm and moved to the city. There are villages here and there, most are very small. Even the larger villages have only a few hundred people living there. 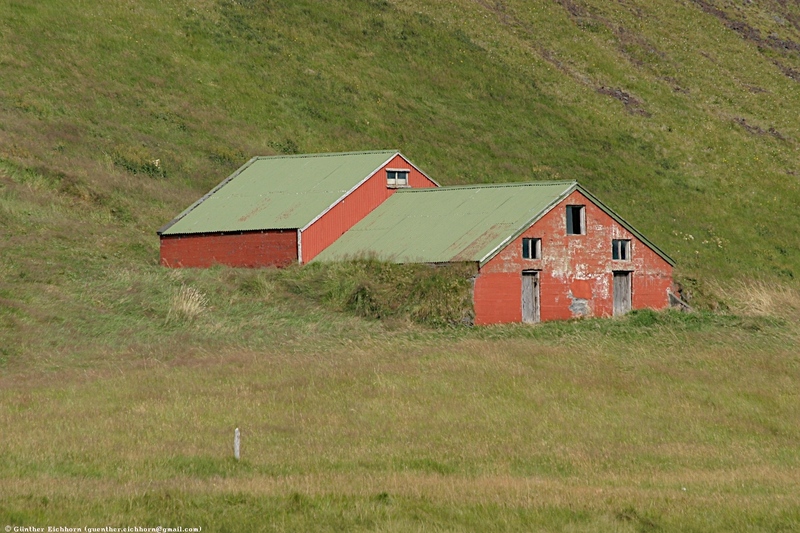 Many people live in isolated farm steads. 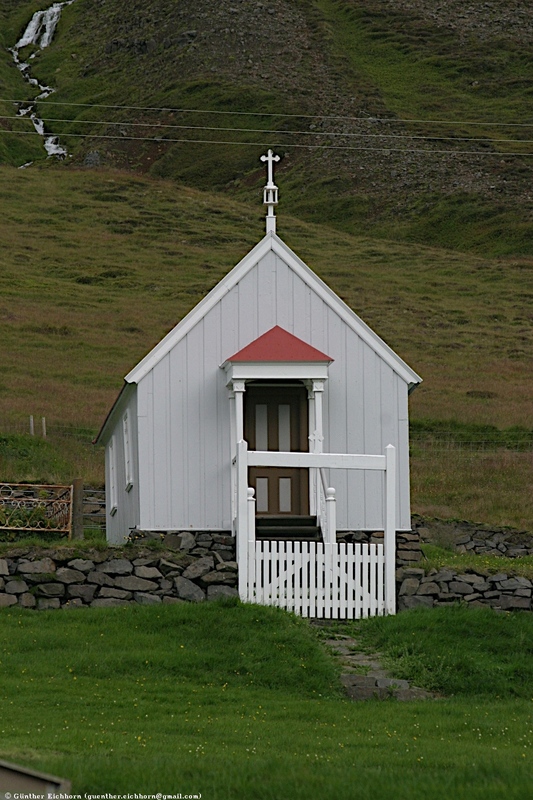 A lot of the farm steads have a small church with them. It seems to me as if a few farms get together and build a church and grave yard that serves the neighborhood. 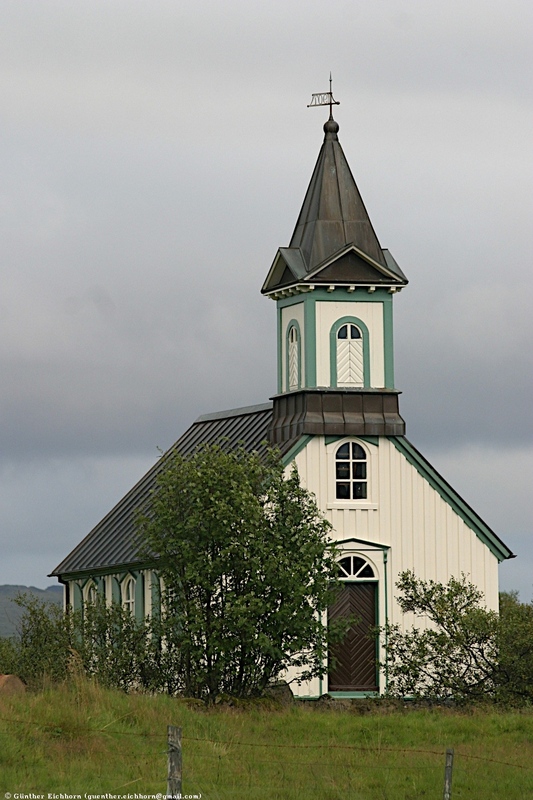 There are lots of different looking churches, from very small buildings with just a cross on them to larger churches with steeples. The variety of different looking churches was interesting to note. I saw one small church at the end of a dead-end valley in the middle of nowhere, with the ruins of a building next to it. It may still have been in use, since there were still three farms in that valley. The people in Iceland were very friendly. Most speak English, so there was never a problem getting around. One evening I talked with a local man for a while. One topic was superstitions and beliefs in fairy tales, etc. It seems that people there very much belief in several kinds of supernatural beings. They are the hidden people, the little people, and the gnomes. The hidden people are similar to regular people in appearance, just more beautiful and somewhat taller. They are thought to be nice and friendly to humans. The little people are smaller than regular people. They are sometimes nice, sometimes mischievous and play tricks on people. The gnomes are generally nasty to people. Seeing some of the landscapes that they associate with these supernatural beings, it is understandable. I visited one of the valleys where the hidden people are supposed to live. It was late in the day, and the setting and atmosphere was myth inspiring, if you understand what I mean. 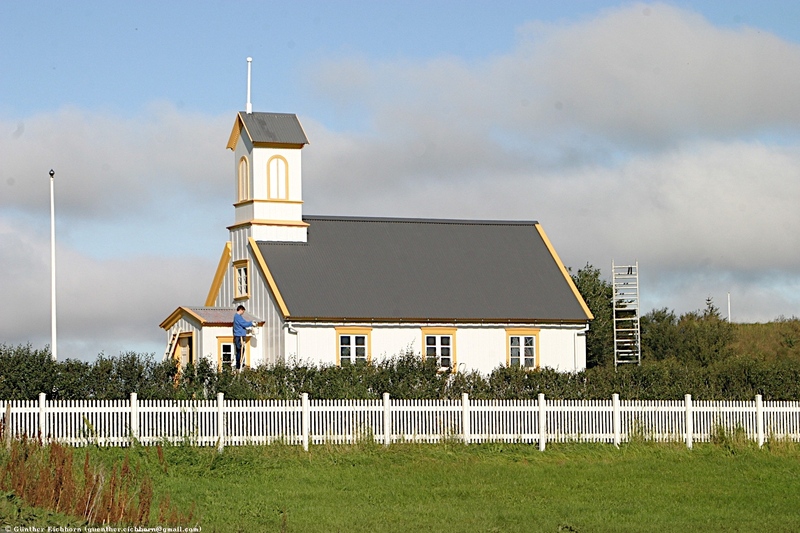 Iceland has a long history, and in particular a long history of a democratic society, the longest in the world. They developed a government entity called the Þing (Thing) in the 9th century. 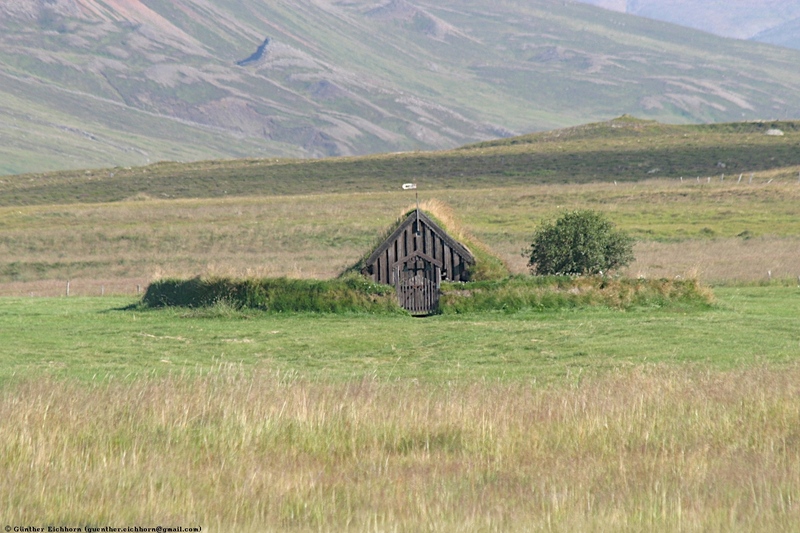 The Þings were assemblies of representatives of all groups in Iceland. They convened once per year and dealt with government issues and with disputes and feuds between different groups or individuals. 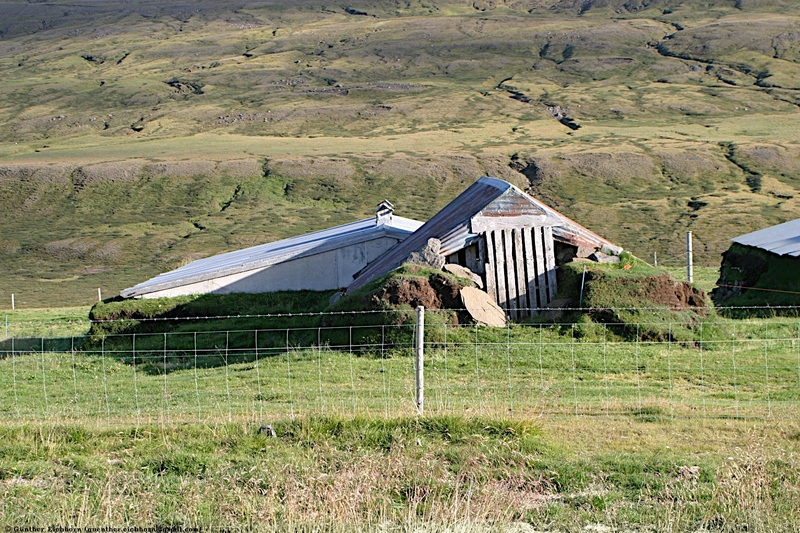 The first Þings were held in the 9th century at Helgafell. This mountain was the holy mountain of the Norse God Þor (Thor). 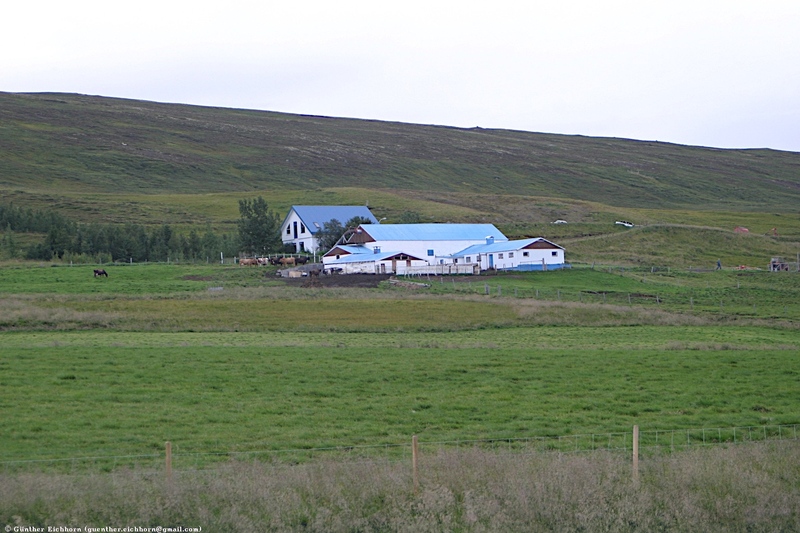 In 930, the Þing moved to Þingvellier and became the Alþing, a more formal democratic organization. It stayed there till the 13th century. In 1262, the parliament surrendered to the Norwegians, and the Alþing was stripped of most of its power in 1271. 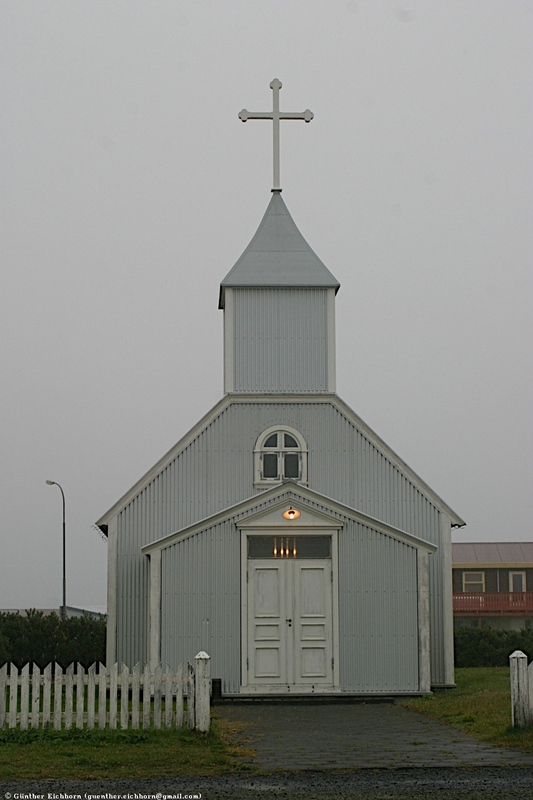 It stayed there as a strictly judicial body till 1798, when it moved to Austurvöllur in Reykjavik, before being dissolved completely. 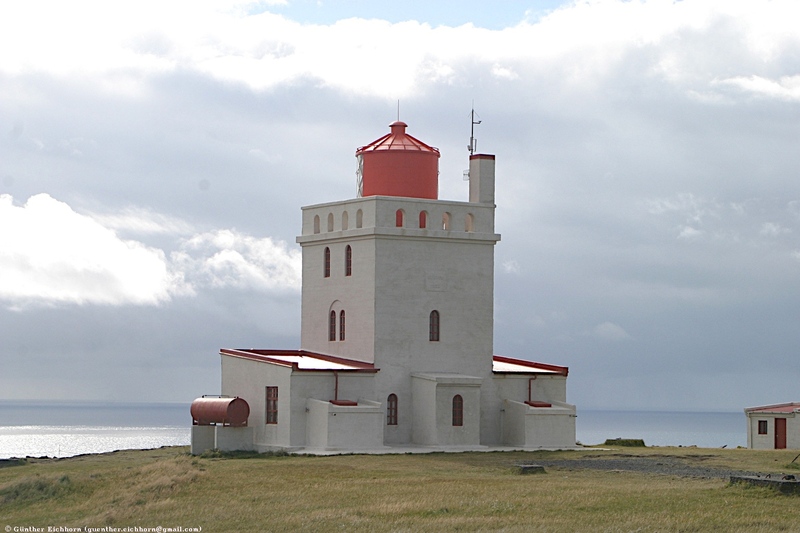 It regained its power in 1843, but it decided to meet in Reykjavik, instead of returning to Þingvellir. This long tradition makes Iceland the by far longest lived democracy in the world, and by far the oldest of current democracies. 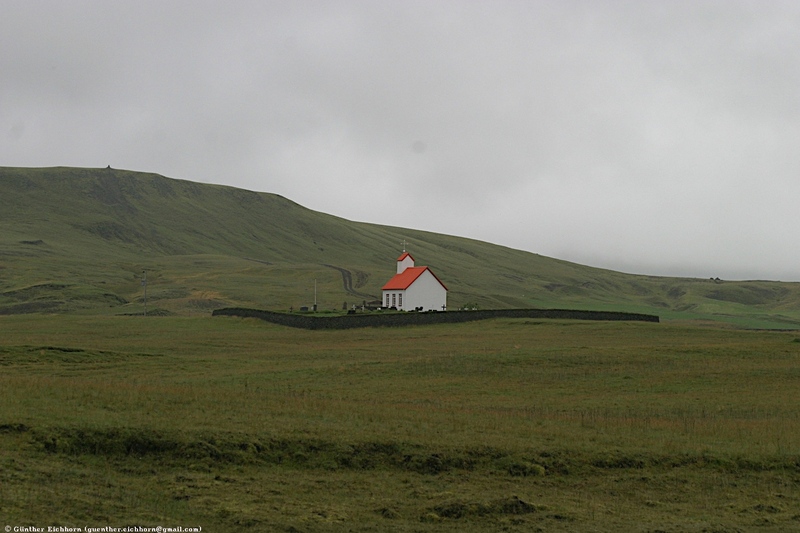 The Þingvellier National Park is a UNESCO World Heritage Site. The main product in the country seems to be sheep. You see them everywhere. 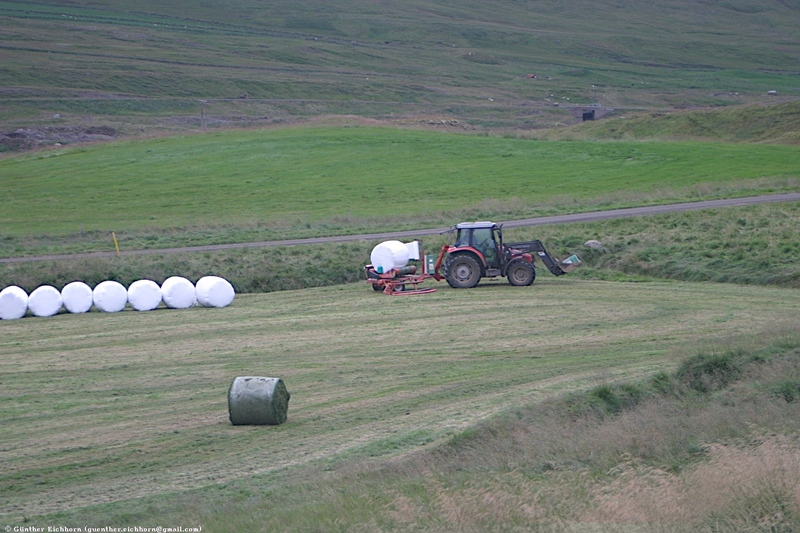 When I was there, they were harvesting hay everywhere. 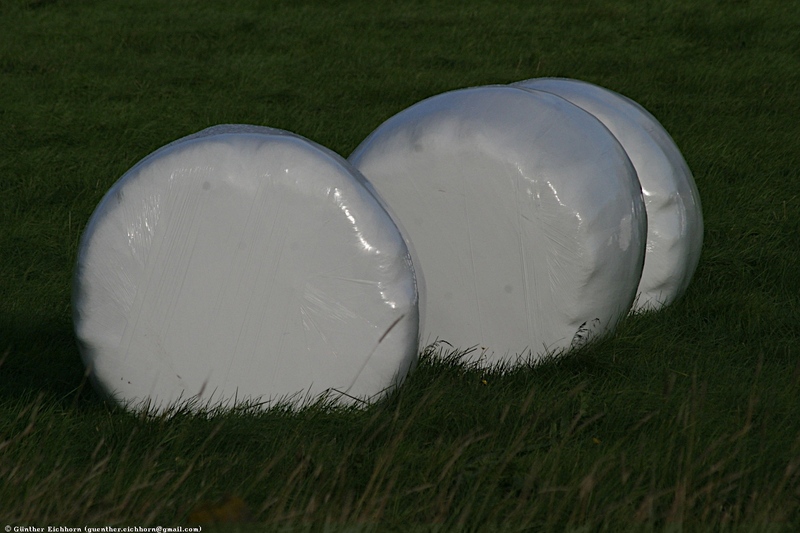 Every grass area had the big white marshmallow shaped bales of hay, enclosed in white plastic foil. 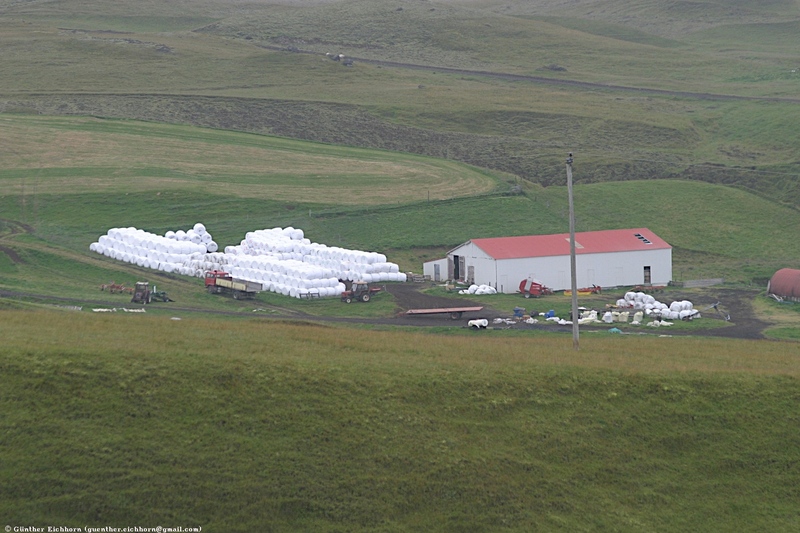 Around the farm houses where huge piles of these white marshmallows of hay. Another important commercial activity is fishing. 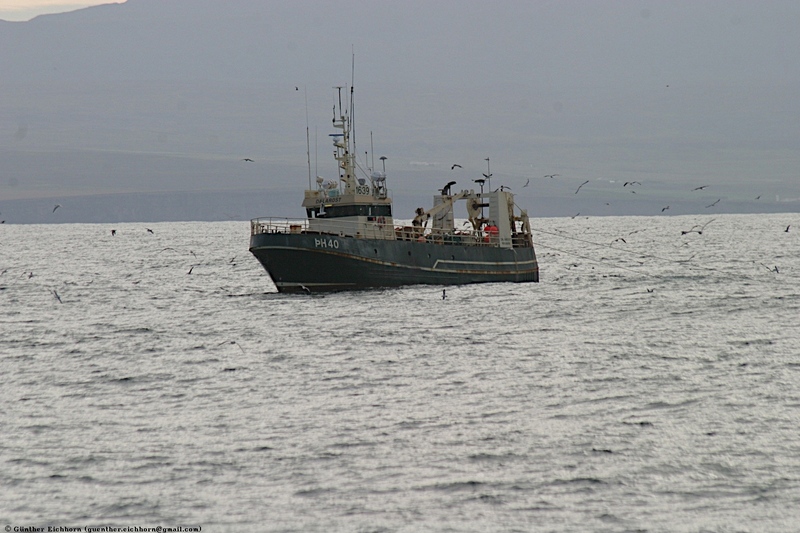 I saw quite a few fishing boats. 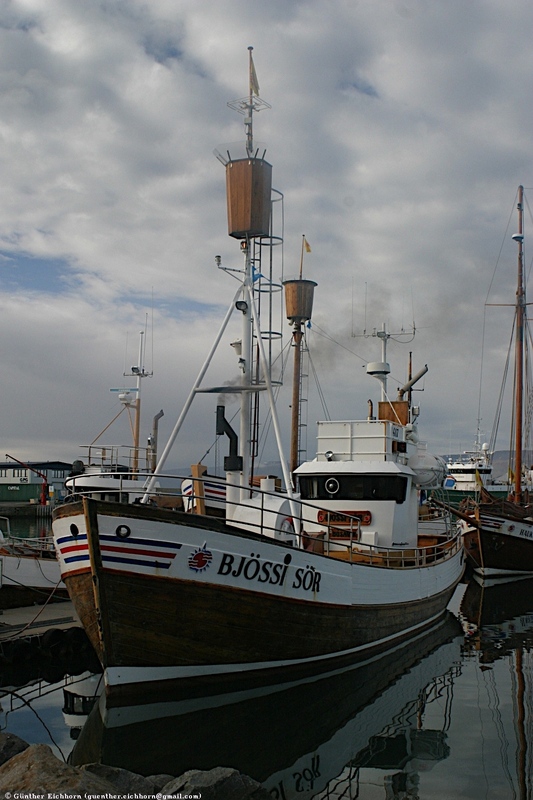 Unfortunately, Iceland intends to start whaling again. I think this is a really sad decision. There is really no need for whaling, anything that whales can provide can be provided through other means just as well. If I had known that before I planned my trip, I might have decided not to go. 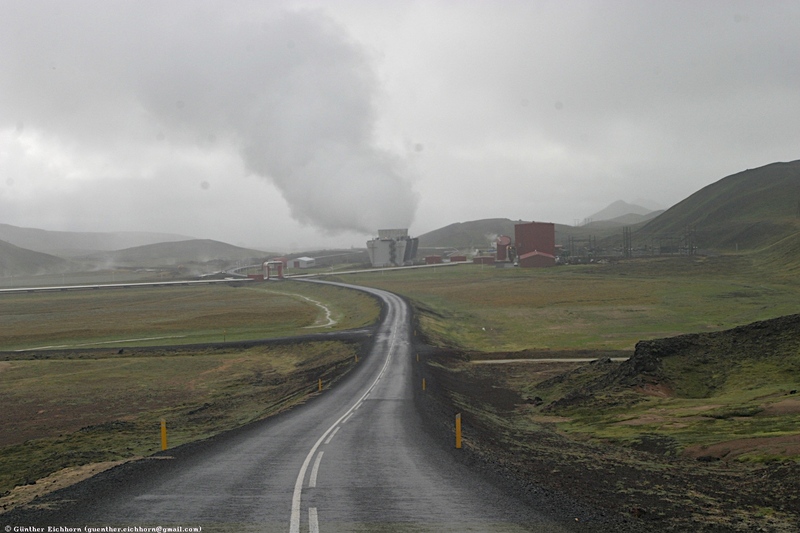 Power generation in Iceland is done a lot by renewable natural resources. Much is hydro-electric power, but natural steam is used as well. The largest steam plant that I saw was at Kröflustöð, the site where drilling a steam well caused a major volcanic explosion. Tourism is by now an important part of the economy, although the tourist season is fairly short (mostly July and August). I did not do the usual tourist things like the Blue Lagoon and Reykjavik. In fact I never went into Reykjavik at all, I don't like cities all that much. But there are other tourist activities that I enjoyed, in particular snowmobiling on Vatnajökull and white water kayaking. 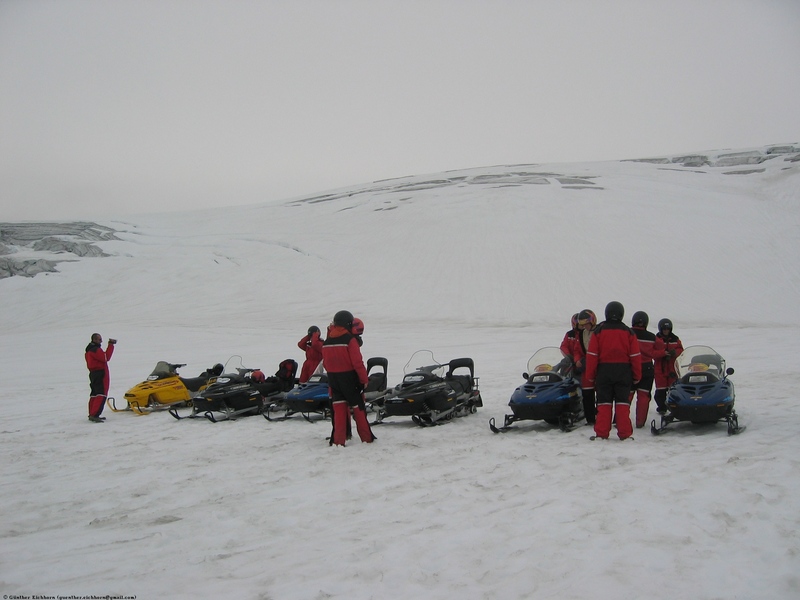 The snow mobile tour started near Smyrlabjargarárvirkjun at a car park at the ring road. We drove up the valley along the Skálafellsjökull glacier tongue to the Jöklasel glacier lodge. The outfit that does the snowmobiling was Glacier Jeeps. They run a pretty good operation. The trip is about 1.5 hours. They gear you up with overalls, boots, gloves and helmet. Then they give you an introduction into driving a snowmobile. They emphasize that you need to stay in the track, since there are crevasses all around the glacier. The guide said that if you do get off the track, stop. Don't try to drive back on your own, you may find a hidden crevasse instead of the track. You are supposed to wait for the guide to come back and get you back on track. It was a fun ride, the snowmobiles can go quite fast. It was pretty bumpy in most places, so you had to really hold onto your mount. The other fun excursion was white water kayaking. I selected Ævintýraferðir, an outfit in Varmahlið. I was lucky on my trip. 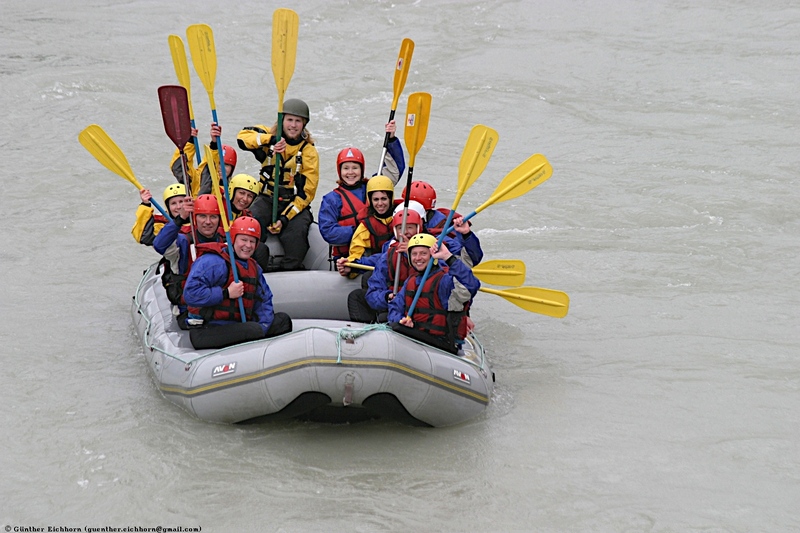 Normally they use the big rubber boats that hold about 10 - 12 people. But when I got there, they didn't have enough people for that, we were only three. So they gave each of us a separate rubber kayak. That was a lot more fun than being in one of these bigger boats. I could handle my own boat and didn't have to depend on what others do. They outfitted us with a dry suit, boots, gloves, a helmet, and a paddle. Then they gave us instructions on what to do and what not to do. For instance, never loose your paddle. 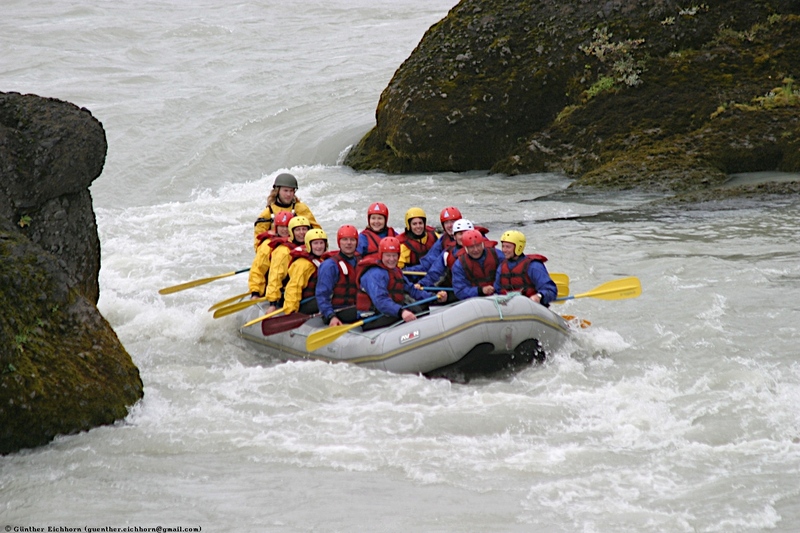 Without that your are really up the creek without a paddle if you have to go through rapids while overboard, float feet first. And of course follow the instructions of our guide. We then took a drive up the valley to the starting point. It took us about an hour to get there. They put the kayaks in the river and we got in the boats. It was a little cumbersome at first with the bulky dry suits, but I got used to controlling the kayak pretty quickly and relaxed. One of the three of us never really got the hang of controlling his boat. He kept spinning round and round the whole two hours, hardly ever going straight. The trip took about two hours and was a lot of fun. The last major tourist activity that I tried was whale watching. 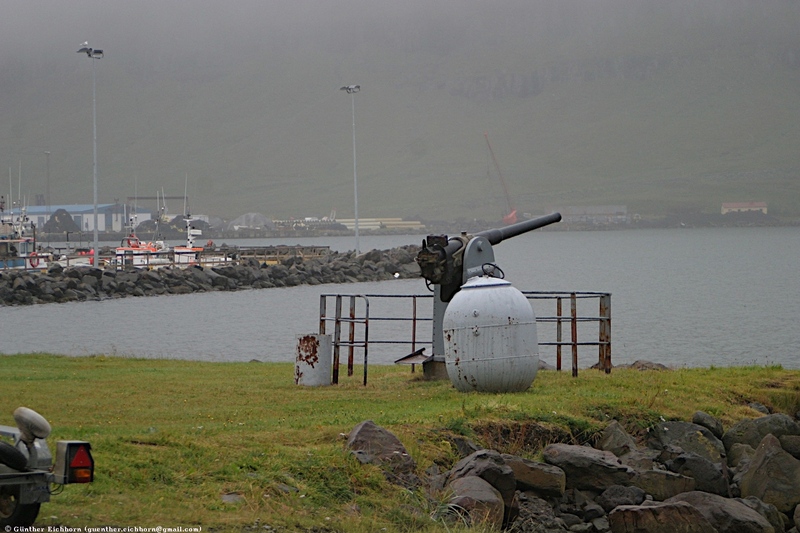 I tried that from Húsavík, which is supposed to be a great place for whale watching. Unfortunately we didn't see any whales, just a couple of dolphins. I had much better luck in Australia a few years earlier. The scenery in Iceland is spectacular. A detailed description is in the Iceland Nature page. The weather was a bit of a problem. It was already quite chilly, (around 5°C (41°F) at night, and around 10°C (50°F) during the day). It rained every day at least a little bit. Several of my days there were quite dreary with rain and low clouds most of the day. Half the days is was a 50-50 mixture of rain and sun, and a few days it was more sunny, with only a little rain. I arrived in Keflavik, Reykjavik's international airport early in the morning. After I got my rental car, I headed south to the coast and then east. After only an hours drive I came across my first hot springs field near the south shore. From there I headed east, past Hella and got a hotel room in Hvolsvöllur. It was there that I got my first inkling about prices in Iceland. 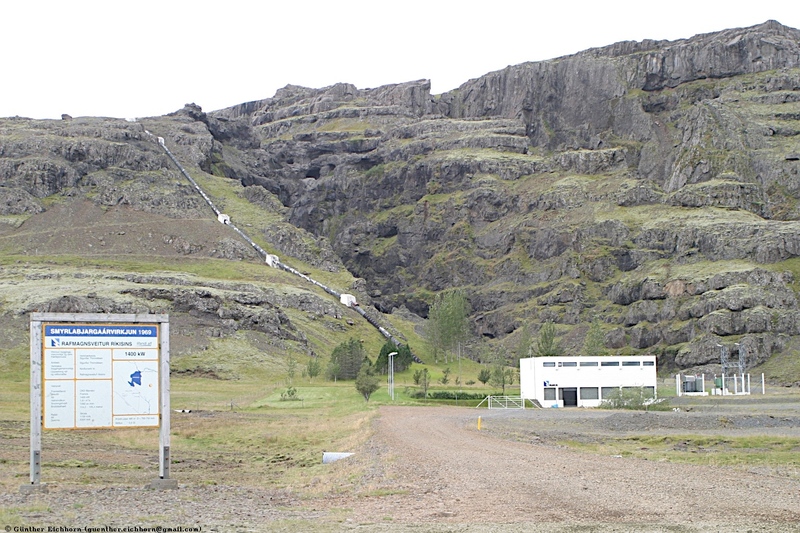 After I had my room I took the rest of the day exploring the area, including my first trip on a 4WD road to Þórsmörk. This is where I saw the warning sign for a difficult river ford the first time and decided to turn back. There are quite a few interesting places along the south shore. At Sólheimajökull you can see one of the glacier tongues coming down from Mýrdalsjökull. 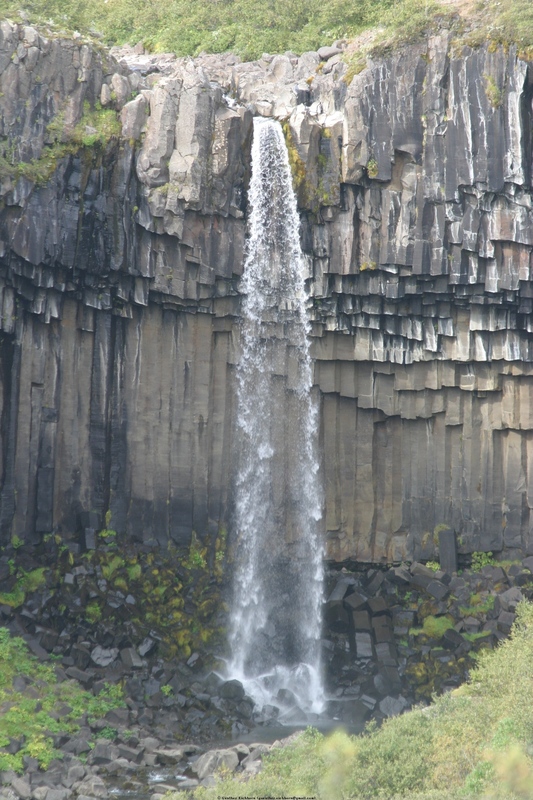 Skógarfoss was a nice waterfall that you can reach in a short walk. 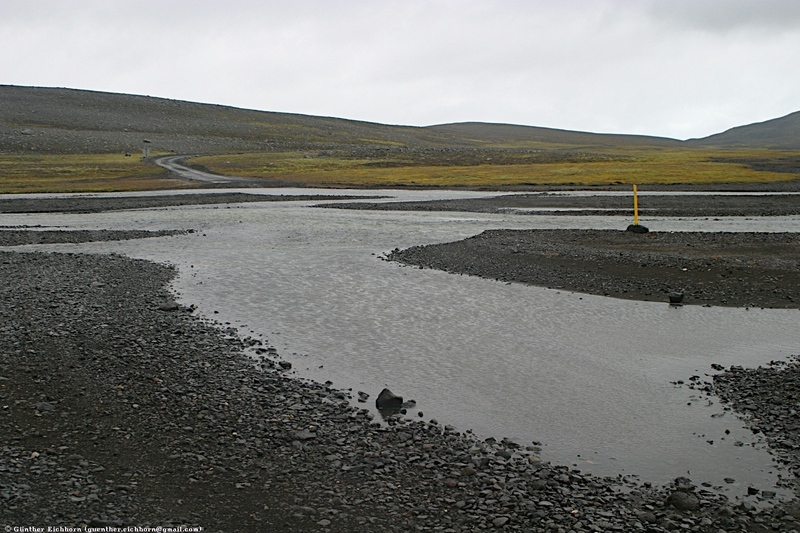 The next day I took the 4WD road from Hella along the Hekla volcano, then east through Landsmannalauga, and then back to the ring road. My tour book was the Lonely Planet Guide. I have been traveling with this series of tour books for many years and I can really recommend them. This book said that the part of the road from Landsmannalauga east is quite difficult, with many river crossings. 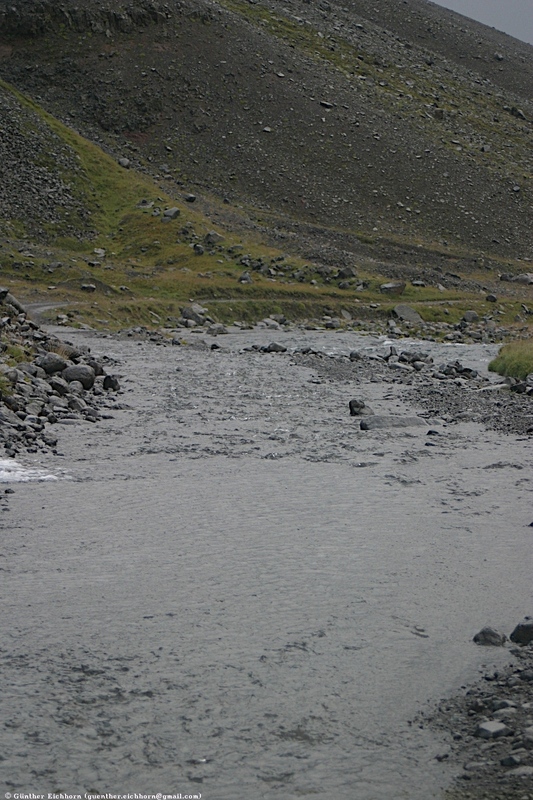 It was true that there were quite a few river crossings, but nothing too difficult. It was a good introduction to 4WD driving in Iceland to get familiar with how the car handles and how it works in rivers. I continued on the ring road. At Skaftafell is a nice waterfall that you can reach after a 15 minute walk. Further north-east along the coast I saw Fjallsárlón and Jökulsárlón, two places where glaciers reach ocean lagoons and calve icebergs. I stayed overnight at Smyrlabjörg, close to where the snowmobile tours start. 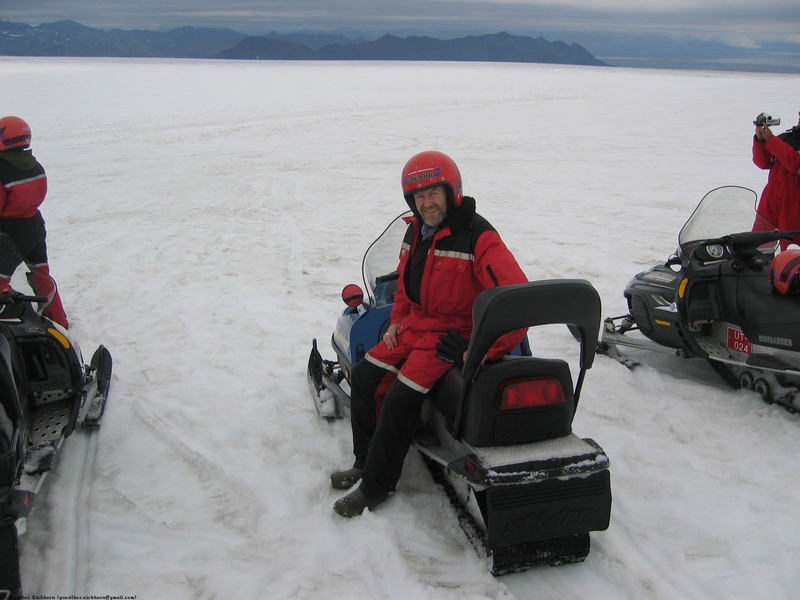 The next morning I was ready for the snowmobile tour on Vatnajökull. I met the tour bus at the ring road and made sure I had a spot. I then drove up the valley to the glacier myself, instead of taking the bus. That saves you $30 and is much more fun for me. 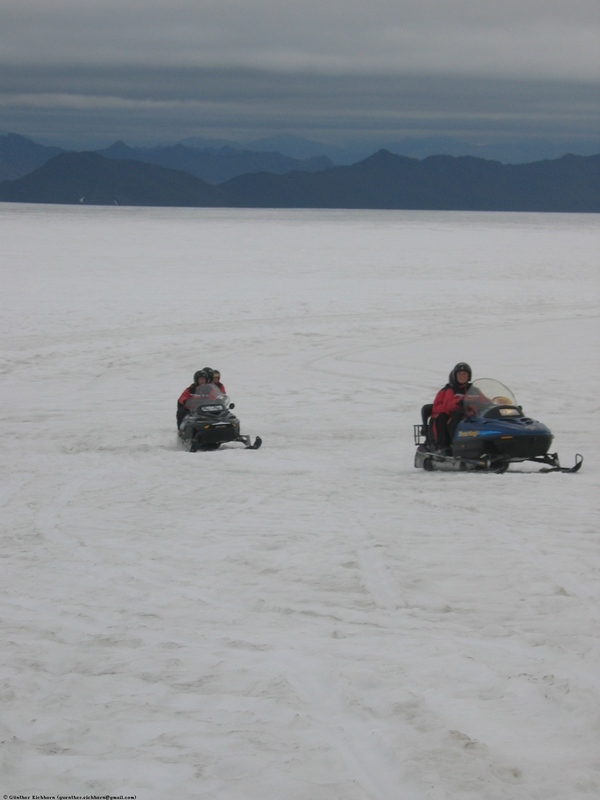 The snowmobile trip was a lot of fun (see above). 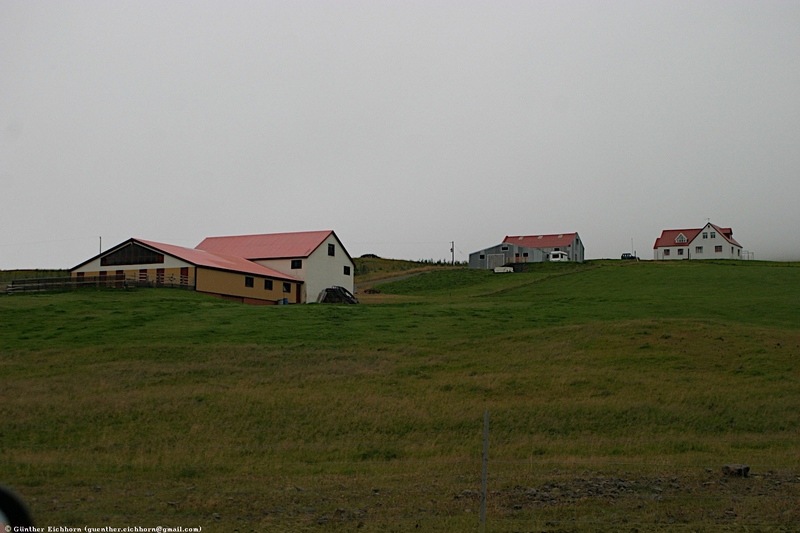 From there I continued along the ring road, past Höfn. 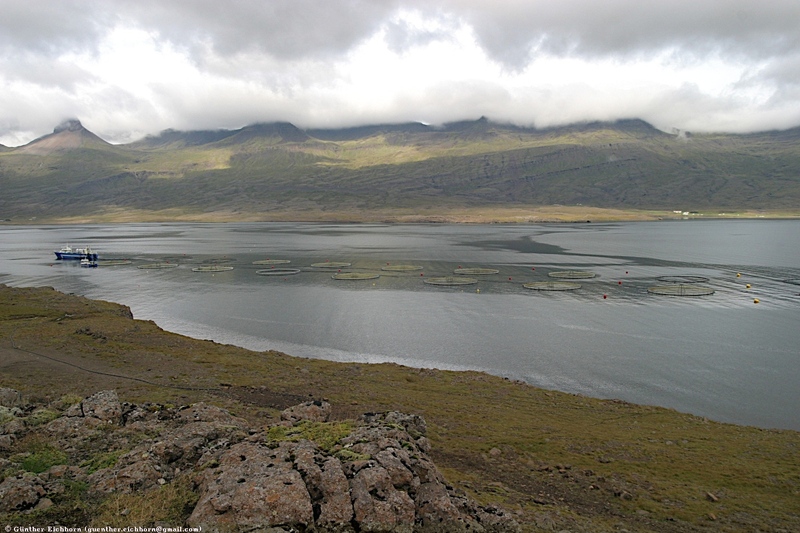 When I got to the Eastern Fjords, I left the ring road and continued through some of the fjords. 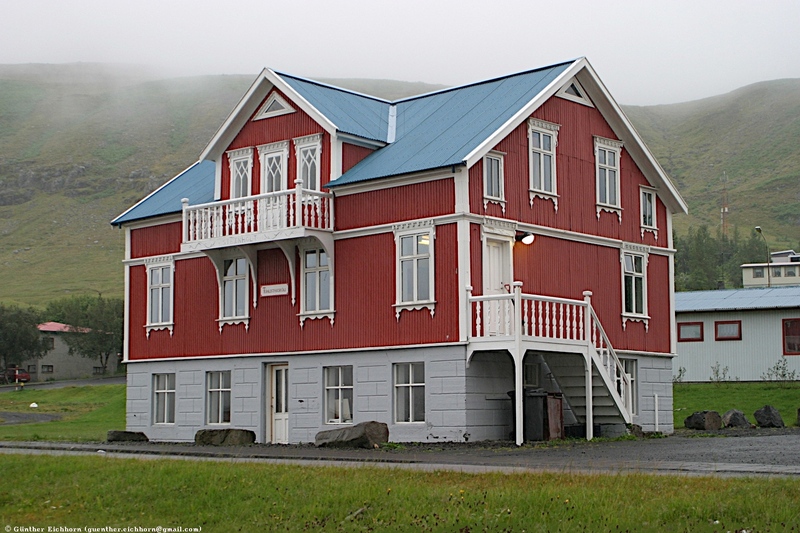 In the late afternoon I started looking for a hotel in Egilsstaðir. The first place I looked wasn't there anymore, it was a seasonal hotel that had already closed. 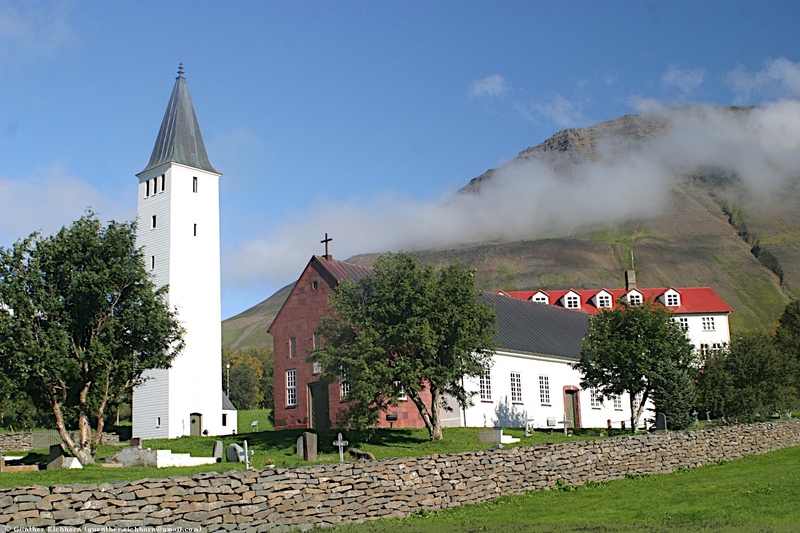 I check out the tour book, and it recommended Seyðisfjörður as as a very picturesque village. I drove there and it was indeed very pretty. The hotel room there already had post-season prices, and was therefore less expensive than expected, so I decided to stay there for two nights and explore the area. Unfortunately these two days were pretty dreary with rain most of the time. I had planned to drive to Egilsstaðir, then up the lake and on to Snæfell at the Vatnajökull ice cap. Unfortunately I was in the clouds most the time. When I got to about 700 m (2,300 ft) altitude and was still in the clouds, I decided it was time to turn back. 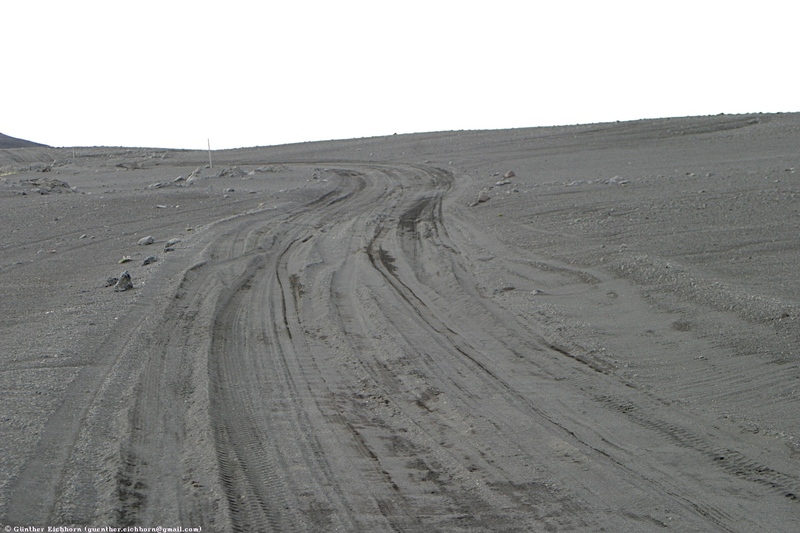 I didn't want to go on the 4WD road up to the glacier in dense fog. So I turned around and headed back to Egilsstaðir and on to Borgarfjörður. 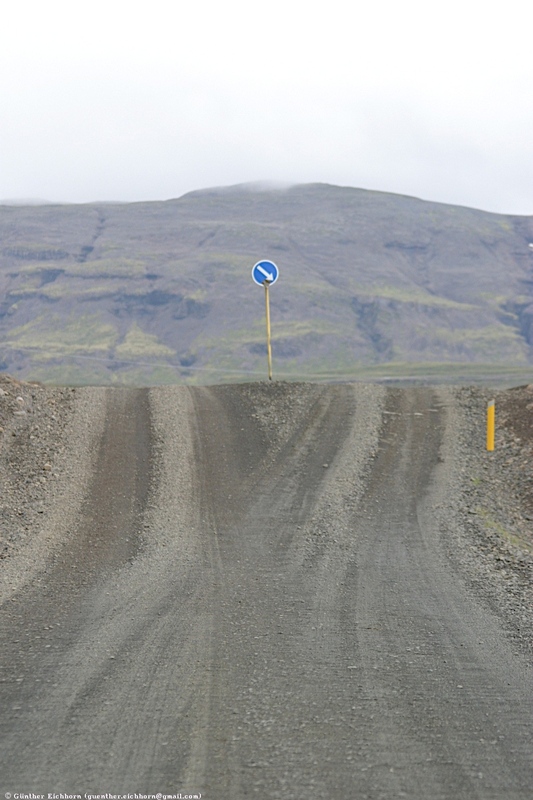 Since my map showed a 4WD road going through two fjords and then back to Seyðisfjörður, I decided to take that road. I crossed to two mountain ranges on a wild, steep track. In the last valley, I went though a deep river (1 m (3 ft) deep), and then ended up the other side of the valley, were the ocean met the mountain. There was definitely no road going anywhere. So I turned back, through the river and over the two mountain ranges. It was a very enjoyable drive, I just love that kind of driving. This was the only time I got a little nervous about fuel. 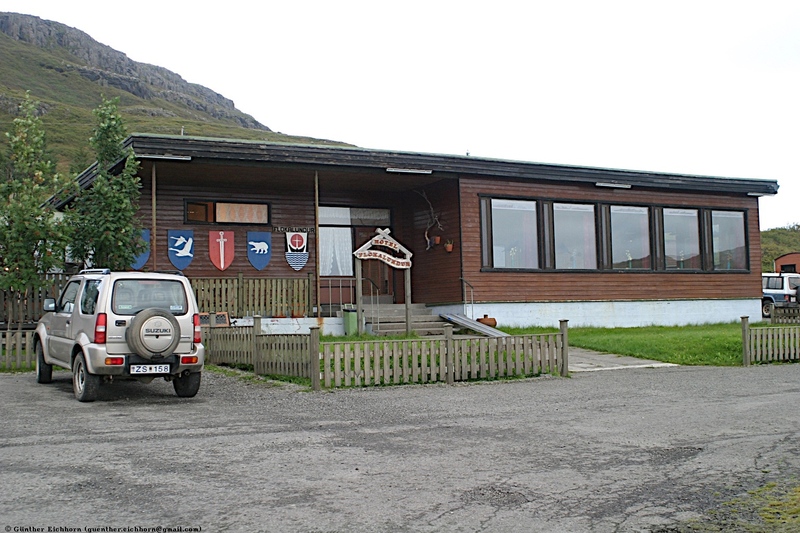 On the way into the valleys I had passed a fuel station in Borgarfjörður. But when I got there on my way back, the pump didn't work. I had planned everything very conservatively, so I had enough to get back to Egilsstaðir. As it turned out, my credit card was blocked, the automatic fraud detection system had flagged it for unusual use. I had another one with me that did work, and a call to the credit card company later cleared it up again. But this is something you have to be aware of when you travel to foreign countries. 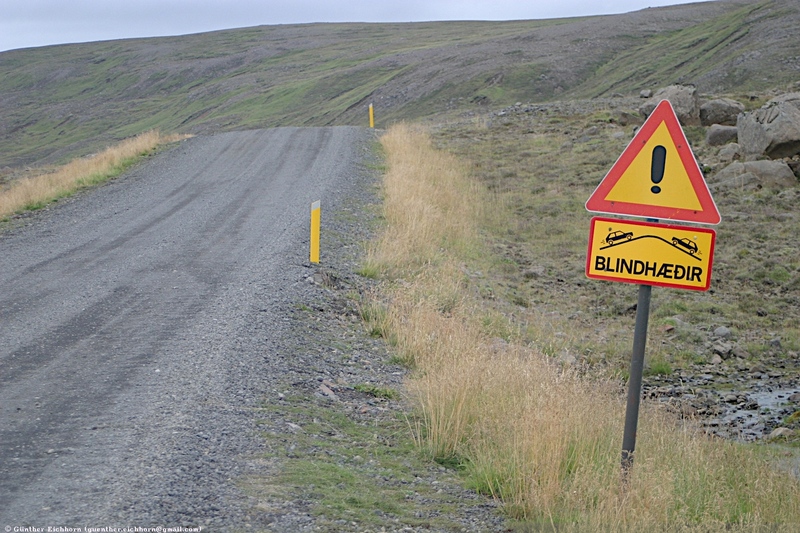 After another night in Seyðisfjörður, I followed Ring Road 1 through some desolate areas to the Mývatn area. 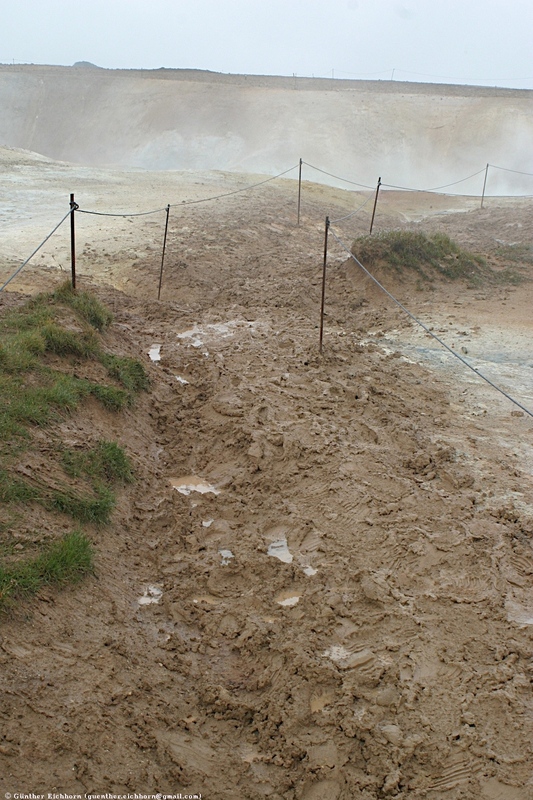 Just before Reykjalið a couple of kilometers east of Mývatn is Hverarönd, a field with hot mud pools and steam vents. Not far from there is Krafla, a very recent volcanic area that erupted in 1975. This is also where the Kröflustöð steam power station is and the Sjálfskapar Viti crater that exploded during drilling for steam. Mývatn is a large inland lake. It has a large volcanic crater next to it. In and around the lake are numerous so-called pseudo craters. These pseudo craters are not created by lava eruptions, they are created by steam eruptions. 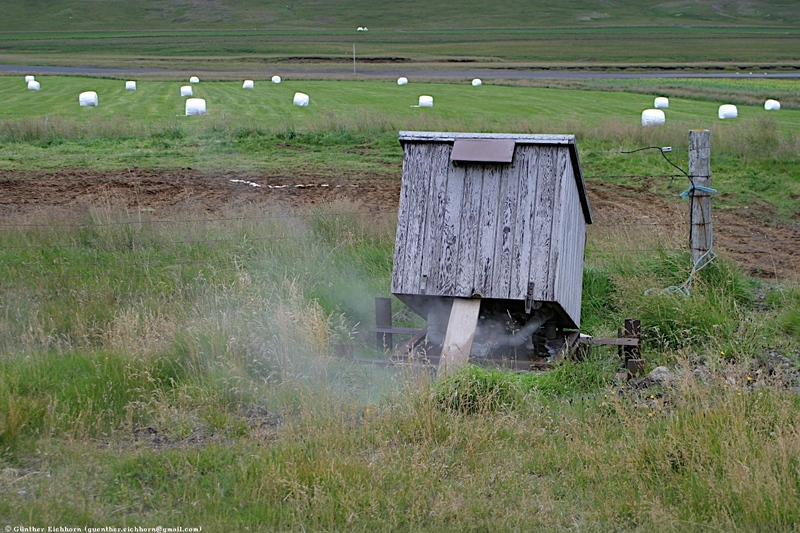 Steam erupts when hot lava flows into water logged soil. These steam explosions create craters up to a 100 m (330 ft) in diameter. The whole area around Mývatn is quite pretty. During the bird breeding season there are a lot of birds in that area. From Mývatn I drove back a few km and then north to the Jökulsárgljúfur National Park, the Dettifoss and Selfoss area. There are some spectacular waterfalls along the course of the river Jökulsá á Fjöllum, one of them rivaling Niagara Falls in size and volume. 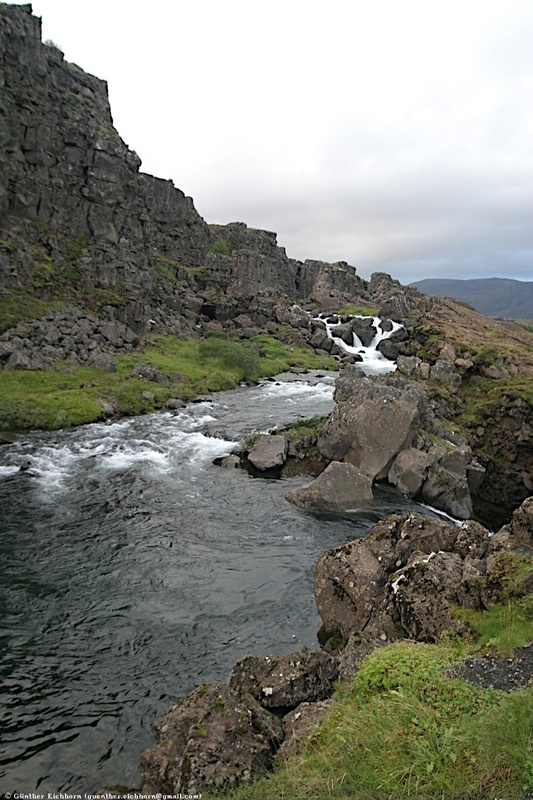 At the north end of this area is the Ásbyrgi canyon, a valley carved out of a lava flow by an ancient large-volume flood. 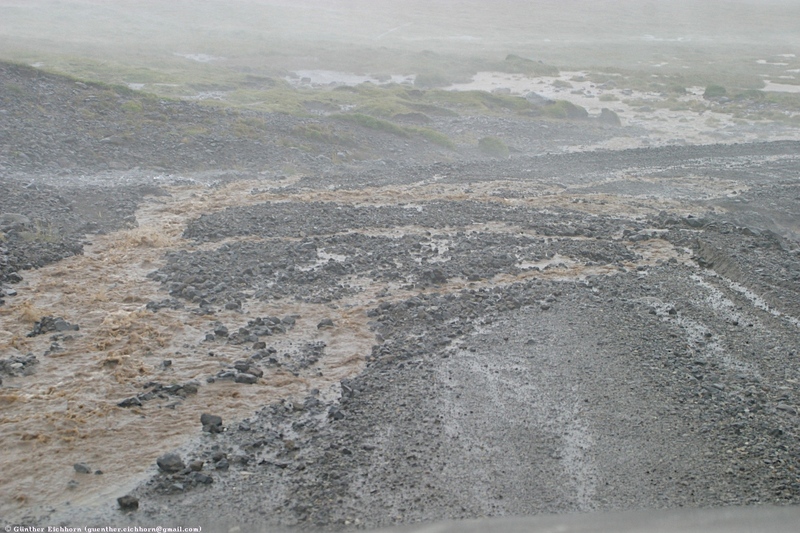 The flood was a so-called jökulhlaup, an immense flash flood, created by an eruption of the Grimsvötn caldera underneath Vatnajökull. This valley is one of the places where the hidden people are said to live. 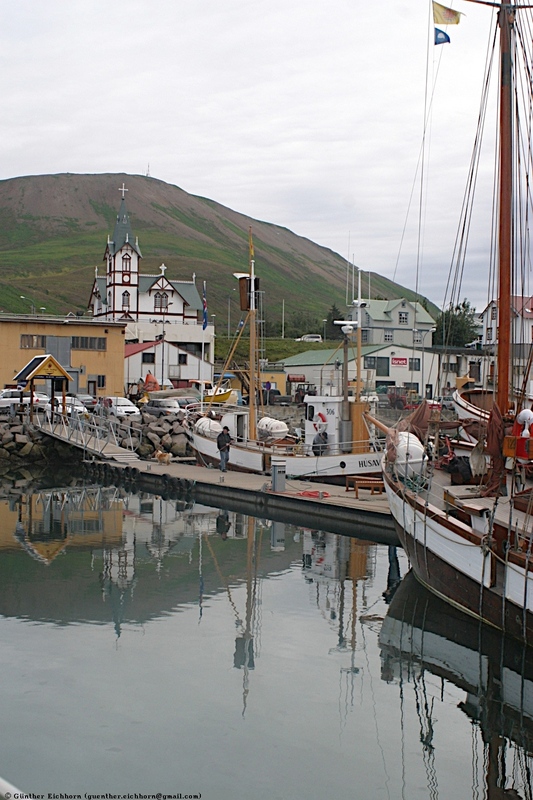 From there I continued north, and then around a small peninsula to my next overnight stop, Húsavík. 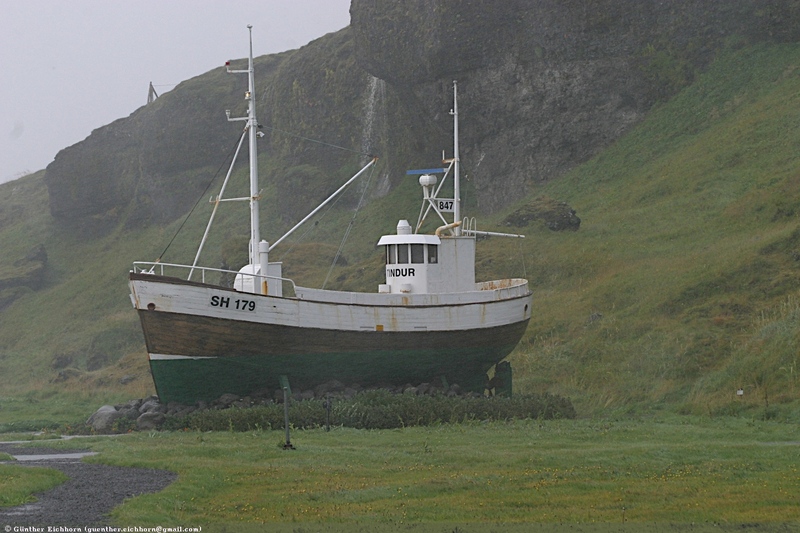 This is the major whale watching port in Iceland. Here I tried to stay in a Hostel the first time to see whether I could save some money. It was a nice place, but I just don't like the bathroom across the hall, and having to wait for the shower to be available in the morning. The whale watching tour the next morning however was a dud. We didn't see any whales. But at least we saw a few dolphins playing around the ship. After the tour I headed south, then east, back to were I had come from the previous day. 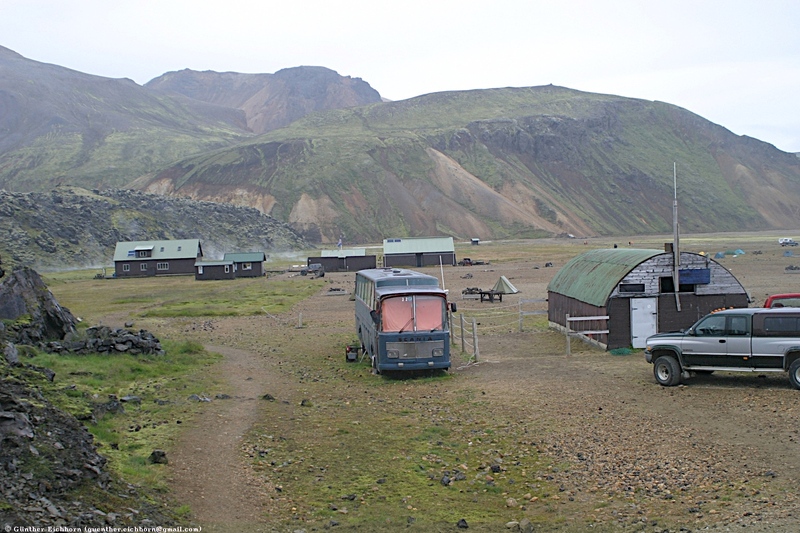 I was looking for a place to stay close to the roads to the Askja Caldera and the Kverkfjöll glacier outflow. This would be one of the longer trips over 4WD roads with no fuel stations, so I wanted to find the closest place with fuel and lodging. 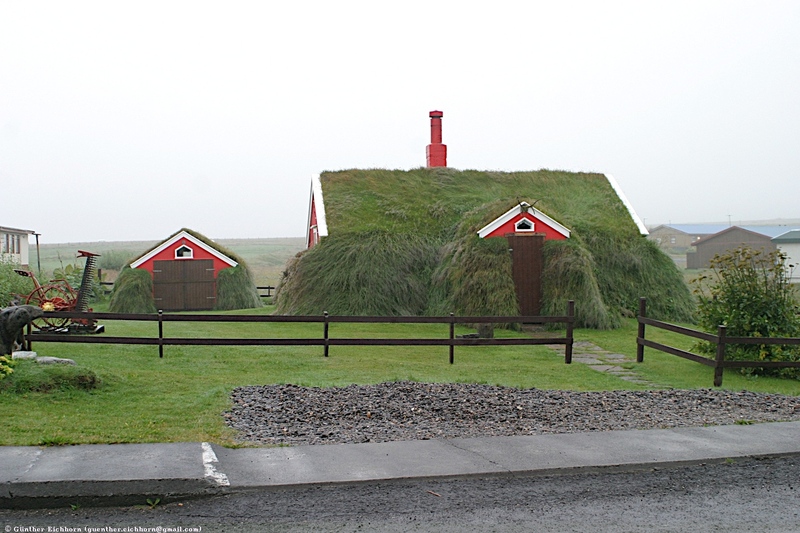 I ended up in Möðrudalur, where I found that they sold fuel out of an above-ground tank, and had rooms available, even though it was a hostel with shared bathrooms. It wasn't too bad, there were only two other people there, and they had come back late from hunting and were not yet up when I took my shower. I took off around 7:00, since I had a long days driving ahead of me. I headed south on the 4WD road to Kverkfjöll. There is a tourist hut there that provides simple accommodations for sleeping bags. 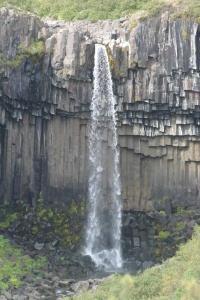 At Kverkfjöll is one of the outflows of Vatnajökull. There is a huge cave where the water flows out of the glacier. It is probably about 20 m (70 ft) high. You are warned not to go inside the cave, because occasionally the roof caves in, which would ruin your day if it would hit you or trap you inside. The area that you drive through is a high plains with smaller mountains. It is covered to a large degree by glacial gravel deposits. And there is always the huge glacial ice cap on the southern horizon, a large flat expanse of ice. From Kverkfjöll I back tracked for a while and then turned west towards the Askja Caldera. This is a fairly recent volcanic feature, erupting in 1875. The eruption first created the large Askja caldera, 4 km (2.5 miles) in diameter. 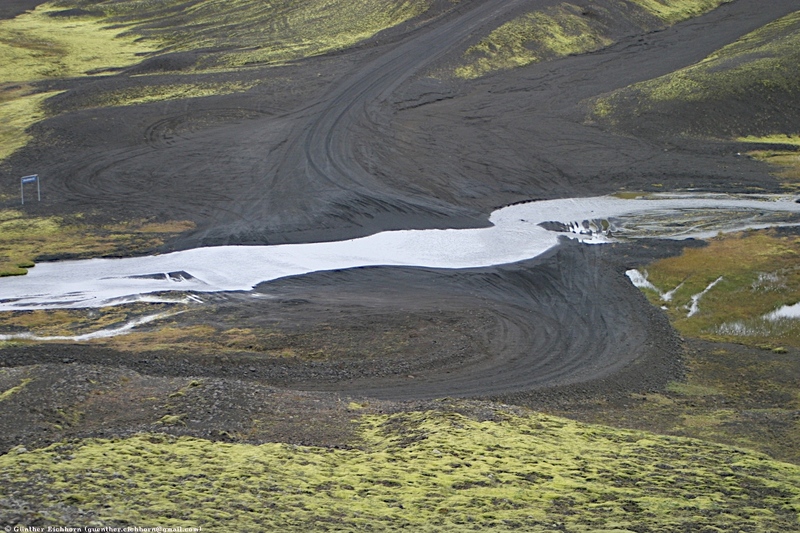 An eruption about 30 years later created a smaller caldera, with the lake Öskjuvatn, within the larger one. This lake is Iceland's deepest with 217 m (712 ft). This smaller caldera is about 2 km (1.2 miles) in diameter. Next to it is an active small crater that holds warm water. People go bathing in this small crater. 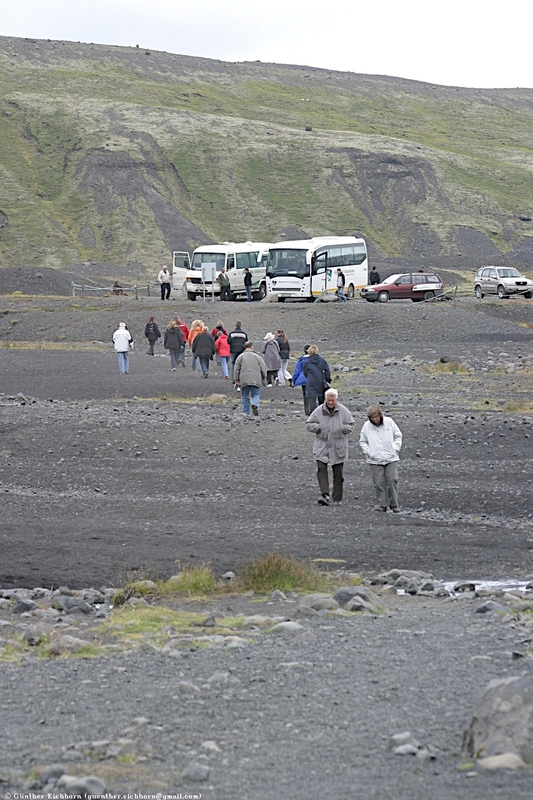 You reach the small crater next to the Askja lake by a walk though almost half the large caldera. It takes about ½ hour to get there. Now it was time to head back north. My fuel situation was good, so I decided to continue directly back to Reykjalið, not to my previous fuel stop. 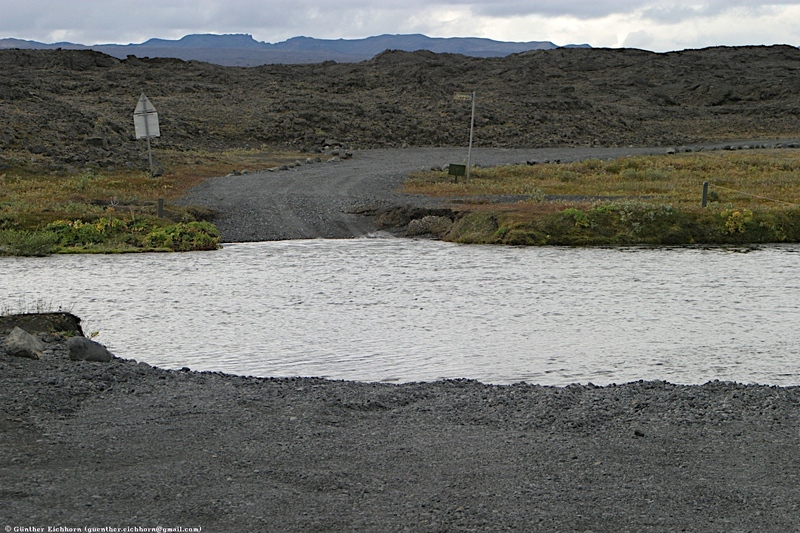 On this road I had to go through the deepest river, a little over 1 m (3 ft) deep. It was close to some other people, so I wasn't too concerned. The little Suzuki Jimmy was up to the task and had no problems getting through. I continued through Reykjalið, on to Akureyri for my next overnight stop. 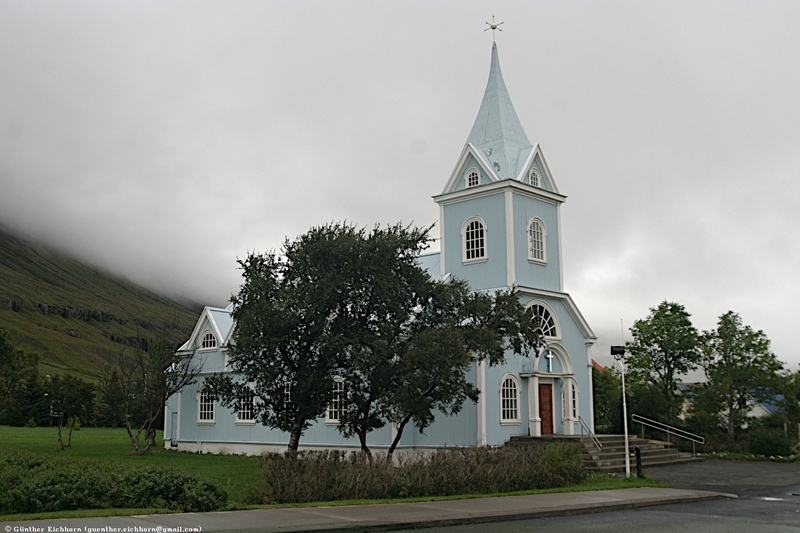 Akureyri is the second largest town in Iceland. I stayed there for a couple of nights. The next morning I was on my way to Varmahlið to go white water rafting. From what I can see, it seems to be the best place to do that. I saw one boat on a river going south in the area around Geysir, but it seemed a pretty tame river compared with the one I was on. 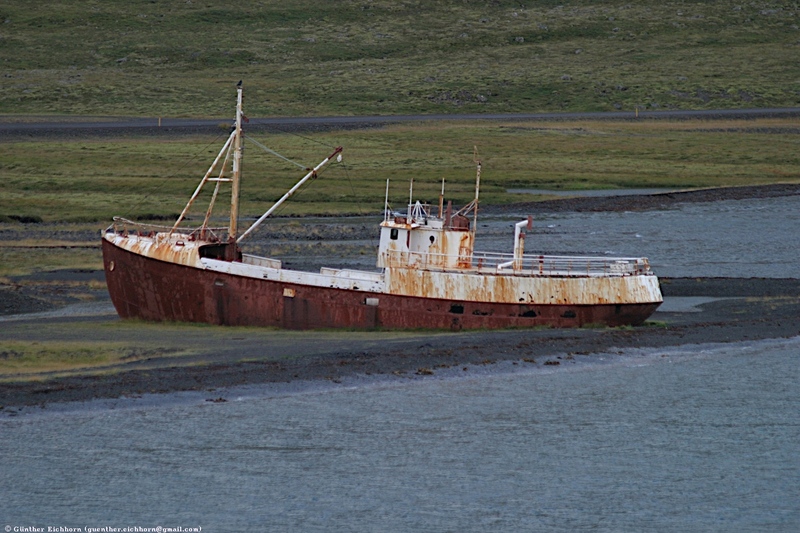 After the rafting I continued north along the eastern shore of Skagafjörður. 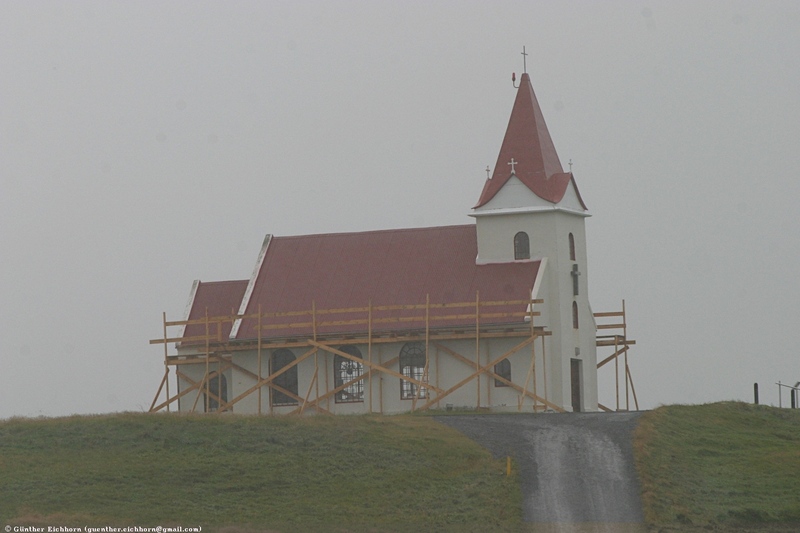 In Hólar is a so-called cathedral, one of the largest churches in Iceland. 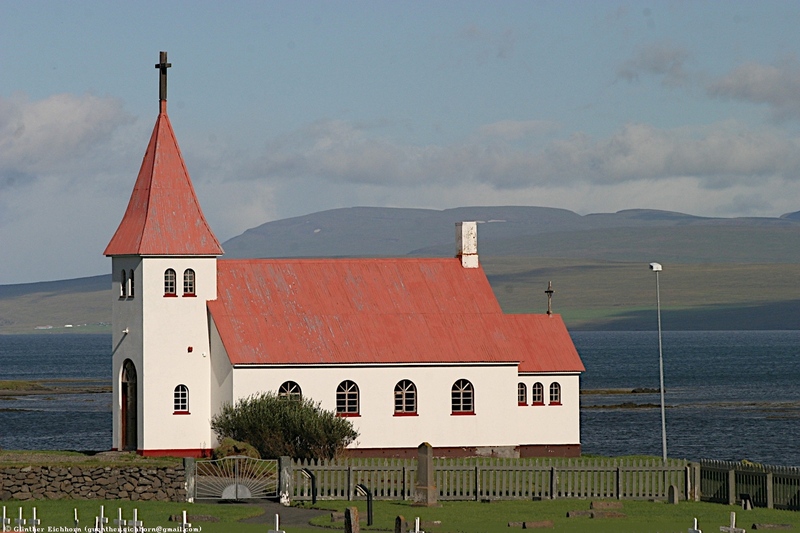 It is a very nice church in a scenic setting, but much smaller than what you normally consider a cathedral. It is worth stopping by. 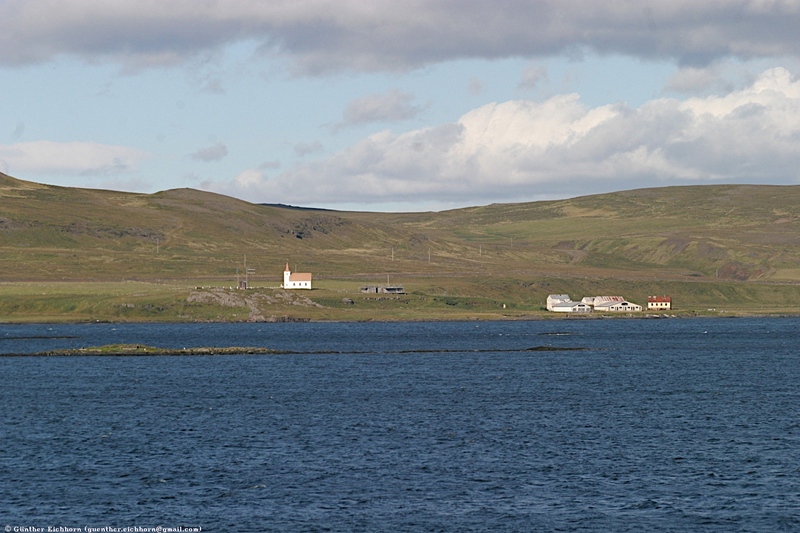 I continued north along Skagafjörður, all the way to Siglufjörður, at the end of the road. This was where I passed through one of two major tunnels on my trip, the other one was on the way from there to Ólafsfjörður. From there I continued south along Eyjafjörður back to Akureyri. The next morning was another early start for the 240 km (149 miles) trip through the center of Iceland back to the south shore. This road is called the Sprengisandur. 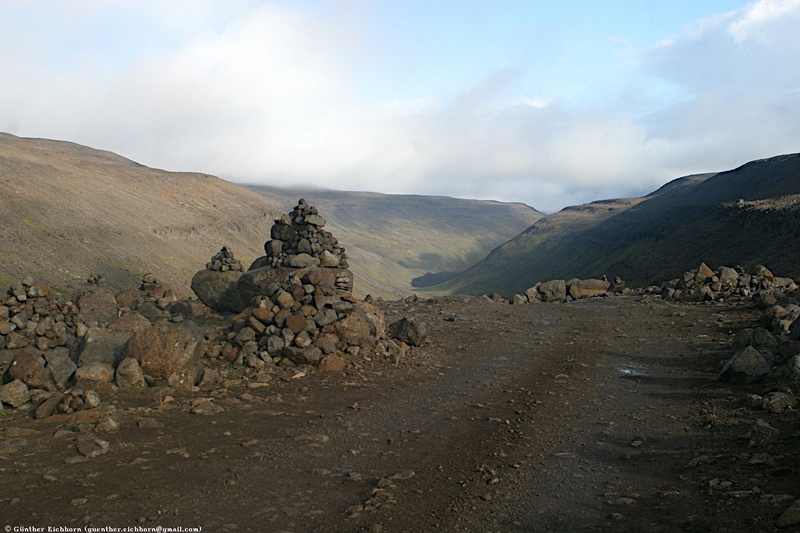 The Sprengisandur has three approaches, one from Varmahlið, the Skagafjörður approach, one from Akureyri, the Eyjafjörður approach, and one from the Goðafoss area, the Barðardalur approach. 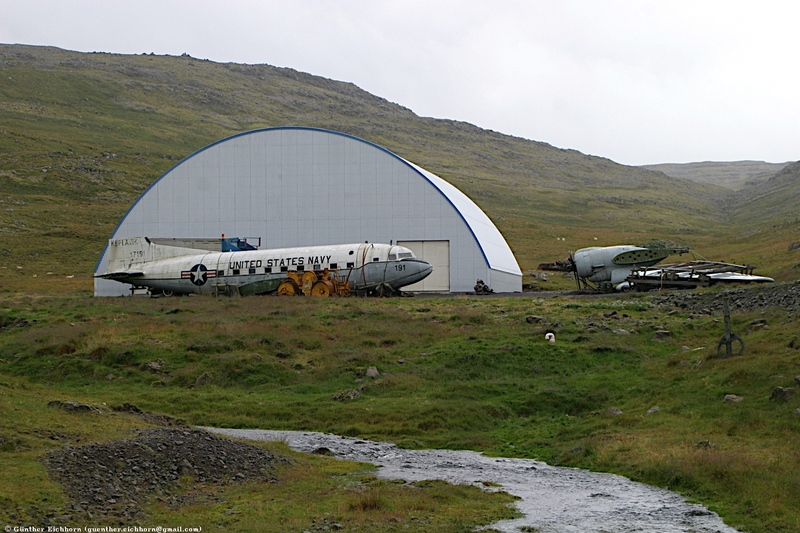 The approach from Akureyri is the most difficult one, so that is the one that I chose. It is a spectacular drive up a long valley. At the end of the valley you get to the high plains of central Iceland. 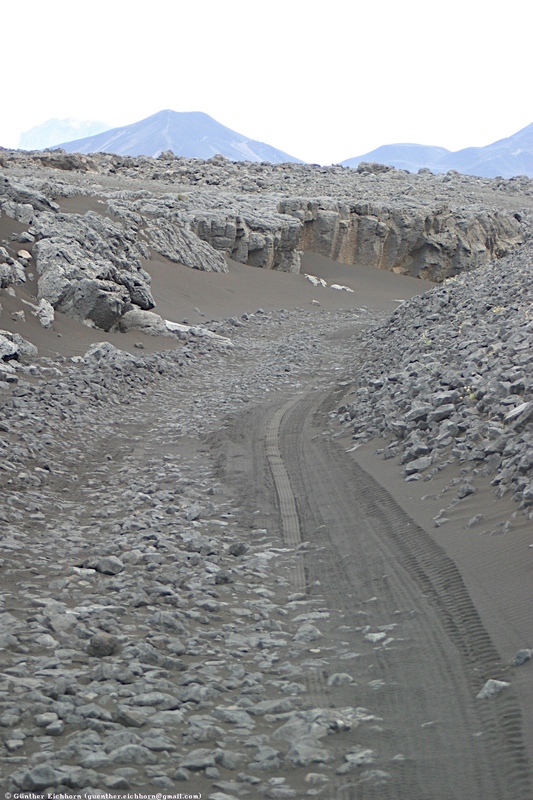 These are the most desolate areas of Iceland, large areas of volcanic gravel and sand without any vegetation. You drive by Tungnafellsjökull, a small ice cap north-east of Vatnajökull, and then past Hofsjökull, the third largest ice cap in Iceland. Towards the end of the Sprengisandur you get to Þorisvatn, a lake that expanded to Iceland's second largest lake when water was diverted to it for power generation. Once back in civilization, I headed for Gullfoss and Geysir. Gullfoss is spectacular waterfall. It reminded me to some degree on Victoria Falls in Zimbabwe, where the Zambezi falls over a wide ledge into a very narrow gorge. The Gullfoss is very similar to that. Geysir is the original geyser, that gave all its brethren, including Old Faithful in Yellowstone, their name. Unfortunately it doesn't erupt anymore. Fortunately a much smaller geyser, called Strokkur is right next to it. Strokkur erupts regularly every 5 to 15 minutes. It is easy to get nice pictures of these eruptions. From there I had enough time to continue on towards the west coast to Borgarnes, where I stayed the next night. In Borgarnes the weather was uncomfortable. It was pretty chilly and very stormy. For the next couple of day the incessant strong winds became somewhat irritating. The next day I drove around the Snæfellsjökull peninsula. I had looked forward to seeing the ice cap where Jules Vernes located the adventures in his book "Journey to the Center of the Earth". Unfortunately the weather didn't cooperate, it was one of my worst days as far as weather was concerned. 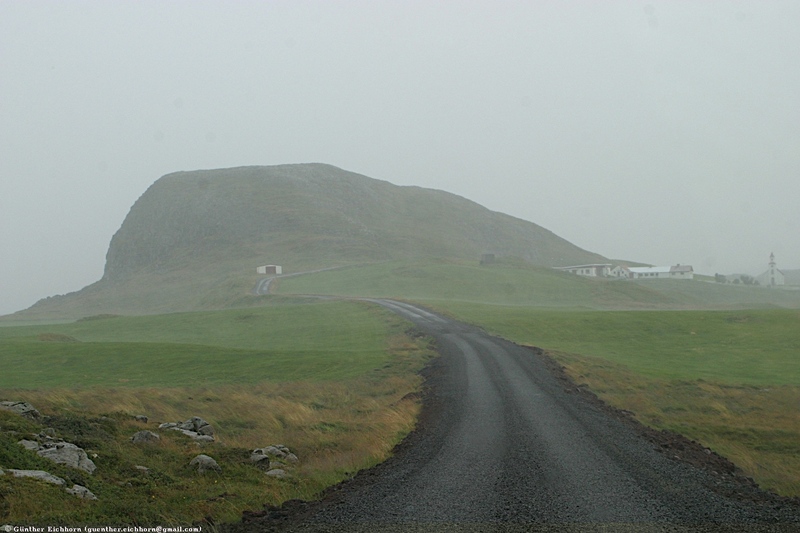 I drove over the 4WD road that goes over Snæfellsjökull, but I was in thick clouds all the time. The road was challenging with the rain, with lots of water flowing down the road, so that part was fun. But I didn't see anything of the icecap at all . I did stop by a small cave called Sönghellir. It has some 18th century graffiti. It is said to resound with the songs of dwarfs. Back on the road along the shore, I visited the church at Ingjaldshóll, near Hellisandur-Rif, the first concrete church in Iceland. From there I headed east along the north shore of the peninsula, on my way to Helgafell. This small mountain was the holy mountain of the Norse God Þor and the site of the first Þing. Unfortunately I couldn't walk up the mountain, because of the driving rain, and even more because of the storm. I couldn't stay on my feet when I started walking up the mountain, it threatened to literally blow me off my feet, so strong was the storm. 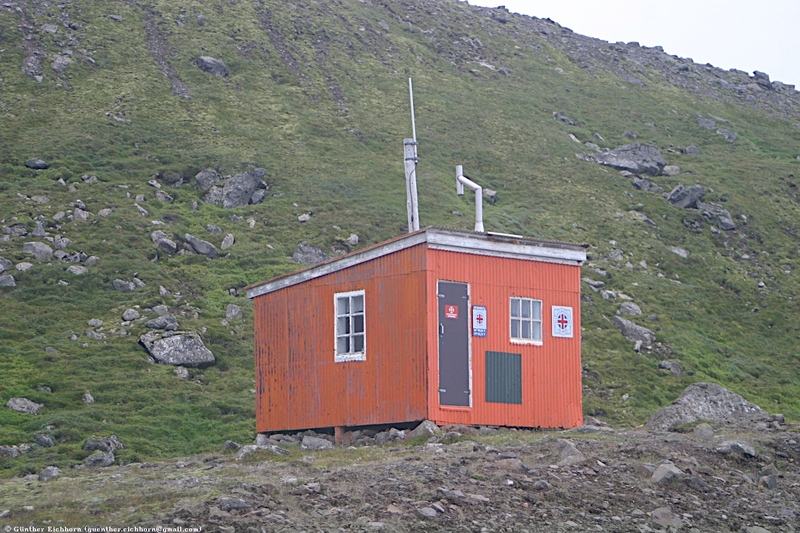 I continued east, then north to the West Fjord area. The drive along the south coast of the West Fjords, over the mountain ridges between the fjords and the through the fjords is very scenic. I stayed overnight at Flókalundur, a little village in Vatnsfjörður. The next day I drove all the way west to Látrabjarg, the easternmost point of Iceland. The sea bird colony there was unfortunately already deserted. From what I understand, this is the best place to see the puffins, they seem to be very tame in this area and let you get very close. 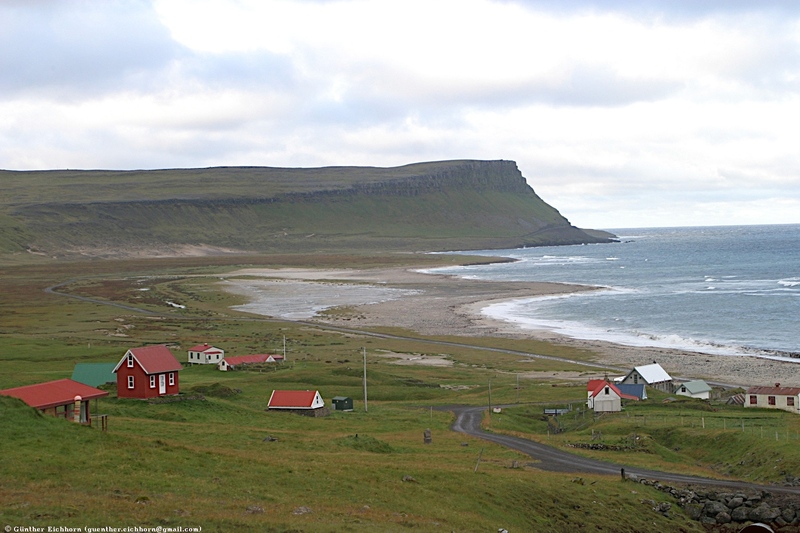 From Látrabjarg I back tracked along the south shore of the West Fjords and then crossed over to the eastern shore along route 605, and then south towards the main part of the island. Around Baula on Route 1 I took some back roads east to Fljótstunga, where there is a nice lava tube. From there I drove to Barnafoss, a nice waterfall. Next to it is Hraunfossar, an interesting spring. There are two lava flows on top of each other. Somehow water has found its way between the lava layers, and flows out from between the lava layers in a spring that is about 150 m (490 ft) wide. It is a very interesting sight. 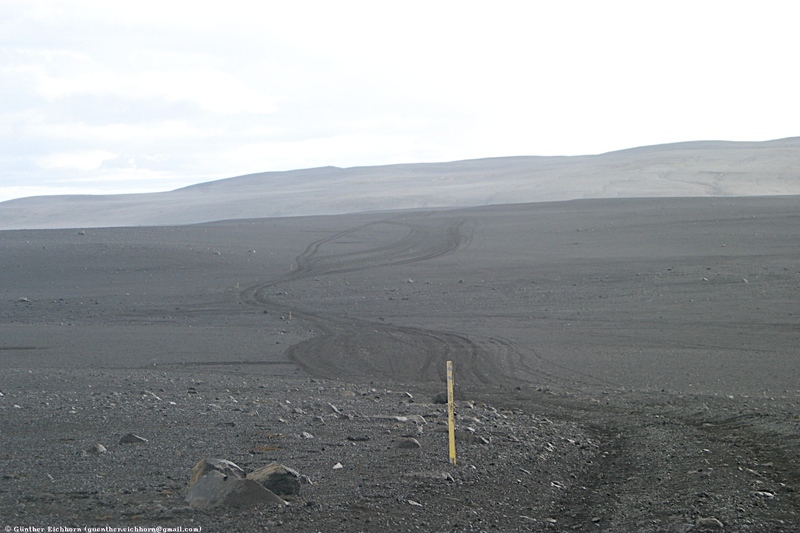 From there I went on my last larger 4WD track, the Kaldidalur from Husafell south. This leads past several of the ice caps, Langjökull the second largest in Iceland, and Þórisjökull and Okjökull, two much smaller ones. 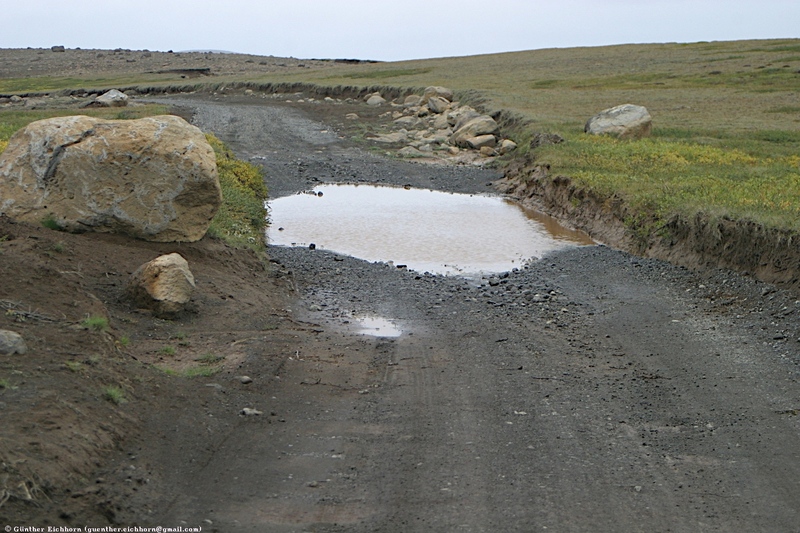 Driving on this road was challenging, because it had a lot of potholes. It had rained (what else is new! ), so they were all filled with water. That meant that you cannot judge how deep the potholes are. Most of them are not very deep, so you can drive right through, but some of them turn out to be much deeper, and give you a big jolt. After I got a couple of those I decided it was time to slow down, it was getting too dangerous. I didn't want to break the car in a deserted area like this. 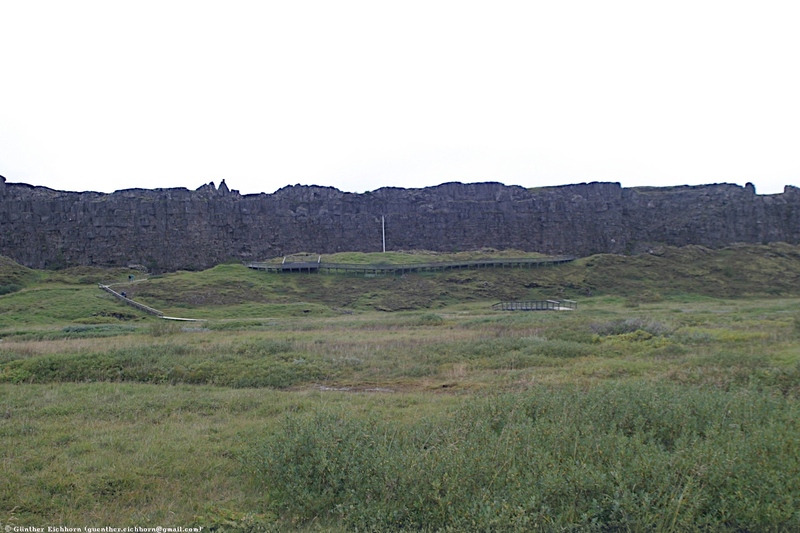 The next stop was the last overnight stop on my trip, Þingvellir. 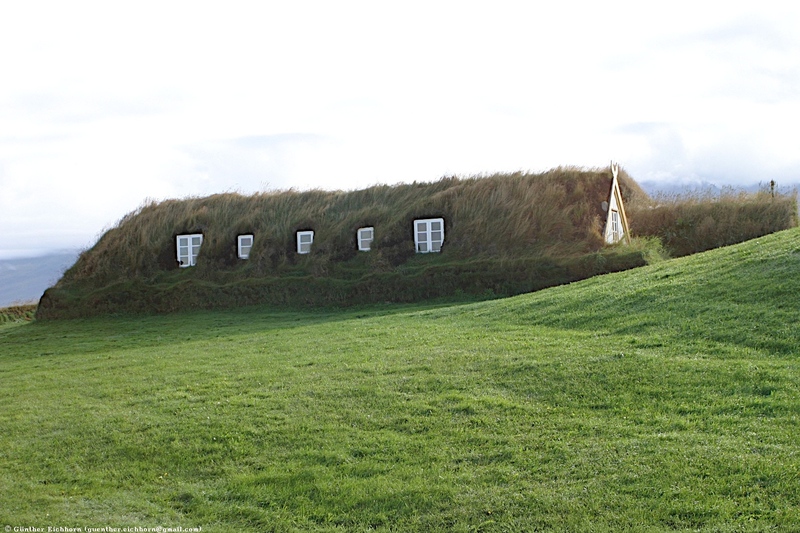 This is a very scenic area where the original Alþing was held. 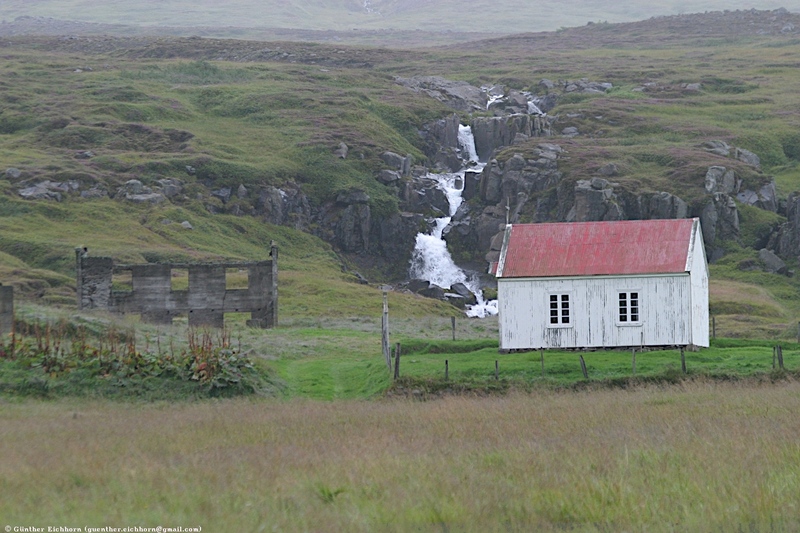 One remarkable, somewhat gruesome part is a small pond along the stream behind the Alþing site. It was used to execute the death penalty by drowning. The next day was the day of my return flight. The flight was not till 17:00, so I had time for a little more sightseeing. I visited the lava tube at Raufarhólshellir before heading back to Keflavik. It was a great trip. I particularly enjoyed the driving. The scenery in Iceland is spectacular. It is certainly worth a visit.